The idea for our U.P. golf trip started coming together last fall. 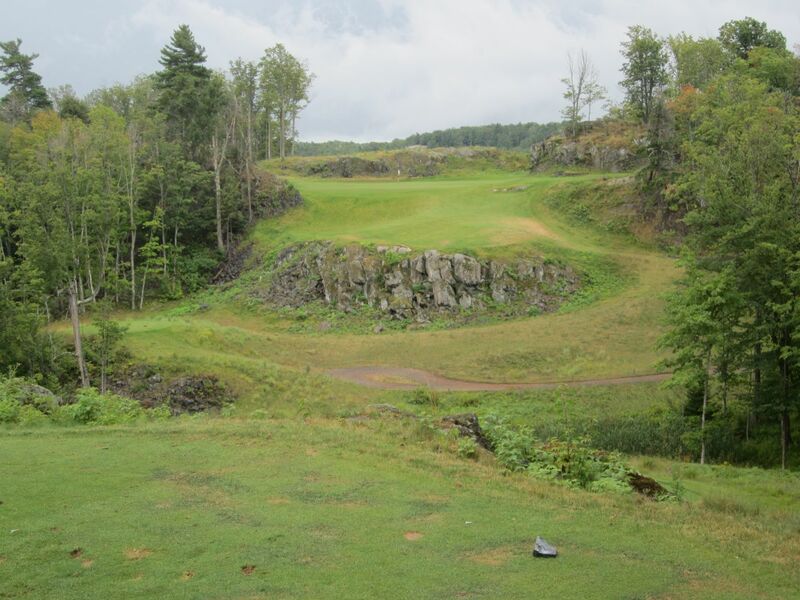 A number of friends from work have made an annual excursion to the Upper Peninsula of Michigan for several years, and as a golf enthusiast and writer I had heard about it often. When my friend, Nick, and I started putting together our Monday night golf league this past winter, the idea was to make an end of the season league championship out of the weekend. As it turned out, only seven league players were able to make the trip, and we added five more friends to make an even dozen. 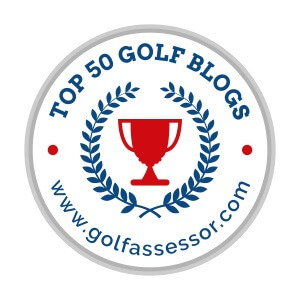 For about nine months I looked at web sites that featured these three courses, and on occasion would search for golf blogs that showed pictures of them. There are not many out there, which leads me to believe these reviews should be getting a lot of hits. It is not only because there is little competition for Google click-thrus, but also because of the mystique that these U.P. 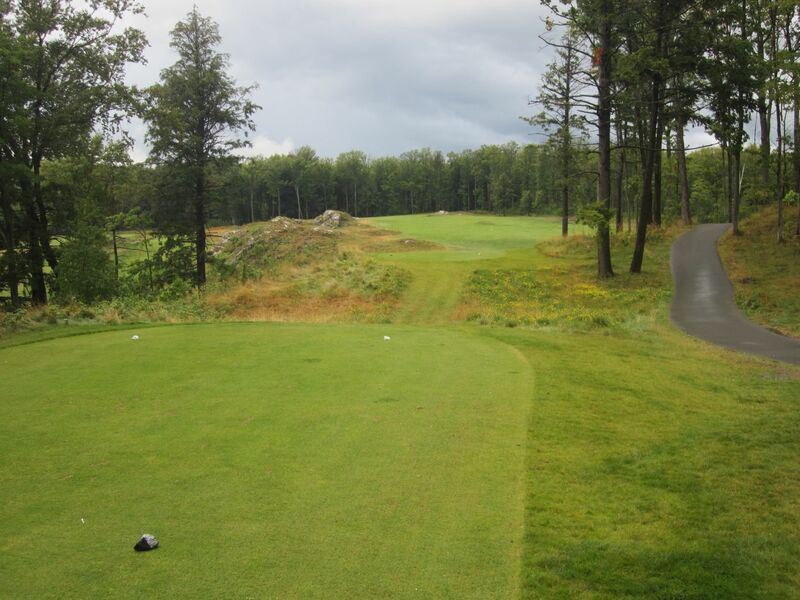 courses have: Sweetgrass, TimberStone and Greywalls are three of the most beautiful and original golf tracks I have found. Now I know what you’re thinking: “Three top 15 courses in a state filled with unbelievable golf courses must cost a fortune!” That could not be farther from the truth. In the U.P, everything is inexpensive, and the cost of this trip is well worth the money. For $329 per person, we were provided three rounds of golf, along with a three-night stay at The Island Resort and Casino. While a casino setting is not ideal for some of us – it can be a bit smoky, is occupied primarily by older people, and has very little else in the immediate vicinity in terms of outside entertainment – it keeps the price of the trip down, and the accommodations are more than adequate. Some of our group likes to gamble, while others do not. 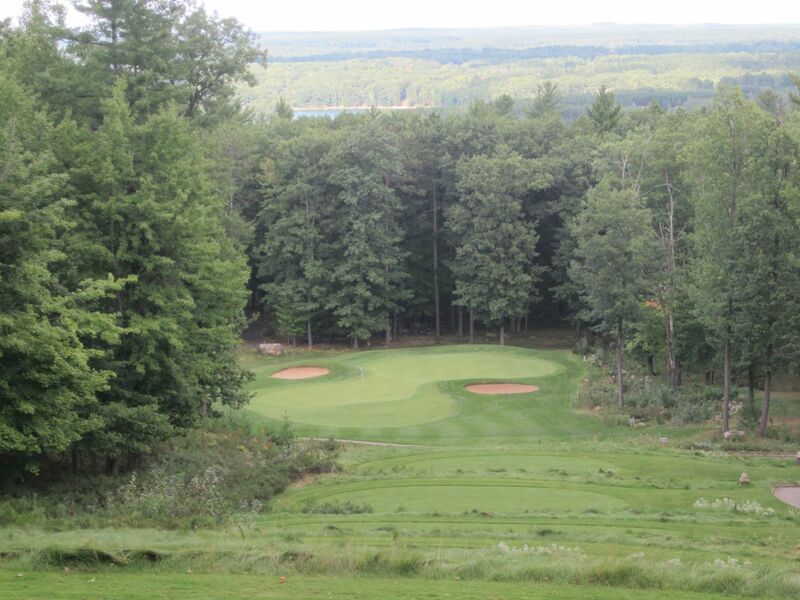 One thing we all agreed on: There has to be a 2013 golf outing to the U.P. If you are like our group, and hope to put together an outing in the U.P. next year, make sure to get on it quickly. This deal sells out fast, and if late to the party there will be very few weekends available to choose from. We did not make the four and a half hour drive from Milwaukee to Harris, Michigan, for the casino, though, nor the accommodations. As avid golfers, we made our pilgrimage to this mecca of the Midwest golf world for one purpose: Golf. For the purpose of playing a lot of really good golf, there are few better destinations. I took the day off of work on Thursday, and left early on Friday morning to get in a bonus round before the trip started. I arrived in Harris, passing by their sign that congratulates the town’s 2004 high school basketball team at Bark River for winning the runner-up sportsmanship award, and was soon at The Island Resort and Casino. My hotel room would not be ready until four pm, so I made my way to the back of the hotel, to the entrance and pro shop of Sweetgrass. One of the wonderful things about the U.P. 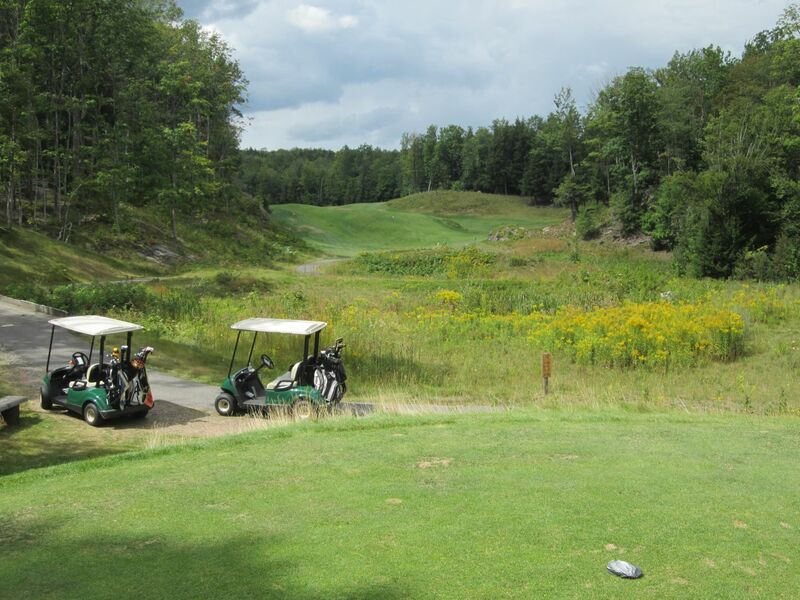 golf trio package is the variety of outstanding golf that will be found. 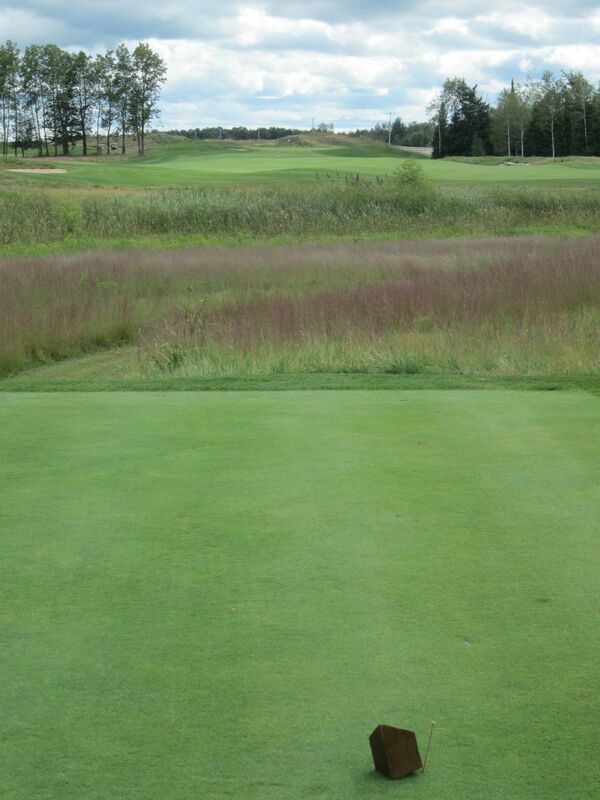 I have talked to a number of people who have made this golf trip who like Sweetgrass the best of the three: It is playable, and not at all gimmicky. The conditions are outstanding: The tee boxes, greens and fairways are all impeccably maintained, and the course is fair and provides countless opportunities for shot-making. 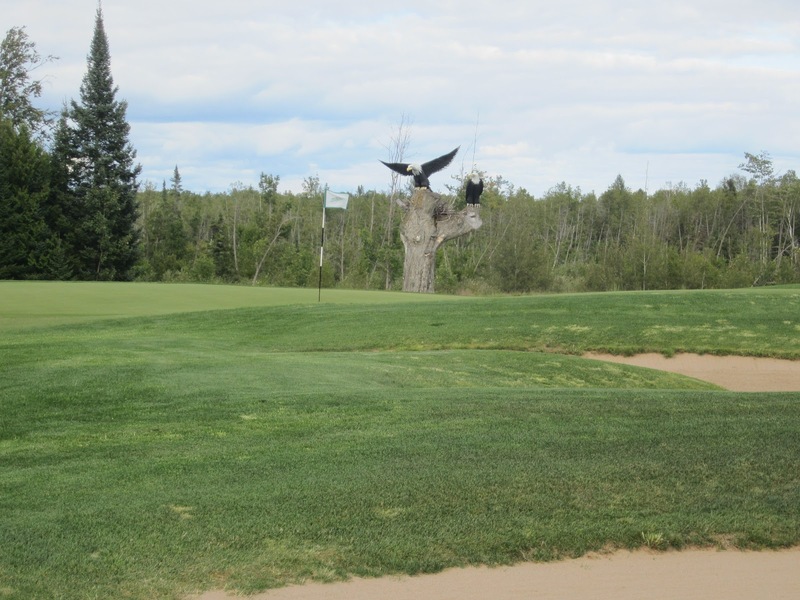 Following my round, I was excited to tell the group about how nice of a course Sweetgrass is. I found my roommate for the trip, Mitch, and a couple of other friends in the sports bar at the casino. We grabbed drinks and dinner, and made our way to the craps table. Bad idea. Ever since a 50-minute long roll at the Atlantis a few years back in which I won some guy $38,000 (and myself $150), I have always thought I could find similar luck on the tables, but have not. An hour later, I found myself down a couple hundred bucks. My lesson was learned – this would be the end of my craps playing at The Island Resort and Casino. Friday’s round started out with a selection of teams for a weekend long Ryder Cup tournament. We had three distinct groups of player skill levels, with four players in each category. I was on a team with Greg and Jeremy (A-level), Brian and Andy (C-level), and Nick and me (B-level). Something was in the air this day, as our team won every single matchup, and every single hole. With a disappointed opposing team, our Ryder Cup tourney was over. Saturday morning of our U.P. golf trip began with a delicious two dollar breakfast at the Firekeeper’s Lounge in The Island Resort and Casino. Our golf package included a plethora of coupons which can be used for one meal per day, a drink and five dollars in slots credit per day. These helped keep costs down. After breakfast, Mitch and I made our way “nort” to Marquette. 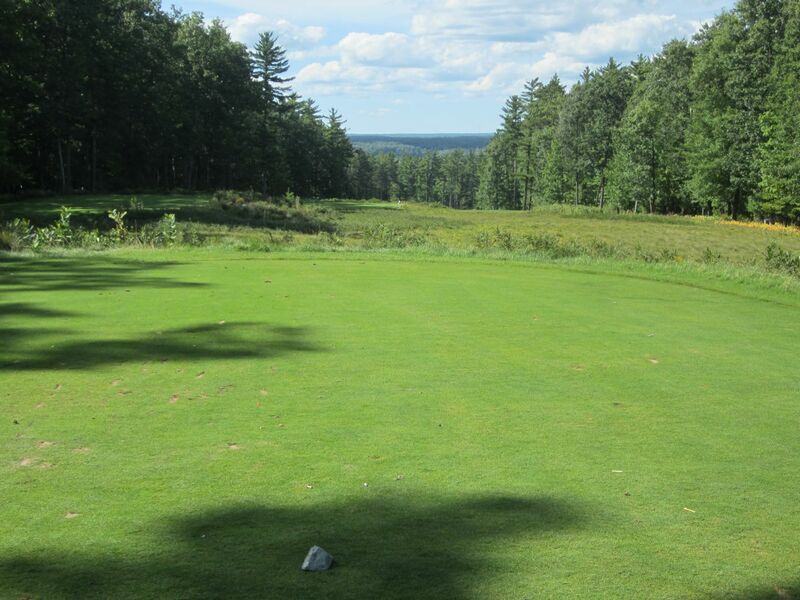 An hour and twenty minute journey, it was an easy drive and we found ourselves at Marquette Golf Club quickly enough. Greywalls was an unforgettable golf experience. We got in eighteen and a few extra holes en route to the clubhouse, then made our way back to Harris. Cold and wet from the prolonged rain delay and overcast conditions at Greywalls, I grabbed a [free] drink from the sports bar, quickly lost my five dollars in free slot play, and made my way to the pool and hot tub. I sat quietly by myself as a couple amassing 500-plus total pounds made out and groped each other across from me. Yikes. Saturday was an early night capped off with an eight-man $20 poker tournament. I played well (for me), and exited in third place after being beaten on the river by Nick’s three sixes. Tough break. I parked in the lot and noticed immediately one of the most beautiful finishing holes I have seen: What looked to be a ski hill of perfect fairway grass cascaded down the mountain side, leveled off at several points by rock walls and leading to a pristine pond-fronted green just short of the clubhouse. The bag drop pulled up on a longboard, and politely offered to grab me a cart. I could tell he loves his job, which in this crazy world is refreshing to see. A wood cabin pro shop was well stocked with TimberStone apparel and gear, and I found myself walking out with my usual ball marker and logo ball, as well as a new golf towel to replace the True Blue one that was still soaking wet from yesterday’s adventure in Marquette. 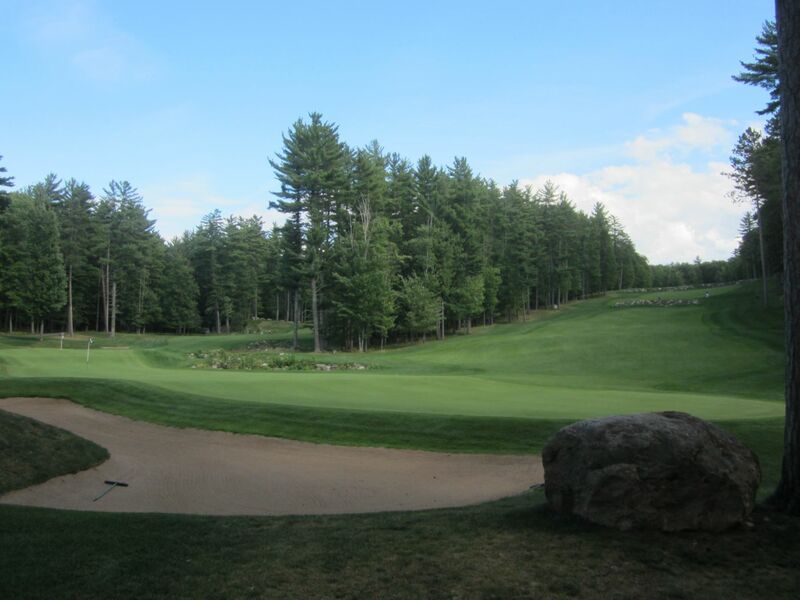 I would have never dreamed that a golf course could match the amazing experience of Greywalls. In its own way, though, which in some ways is a bit Greywalls-esque, TimberStone does it. 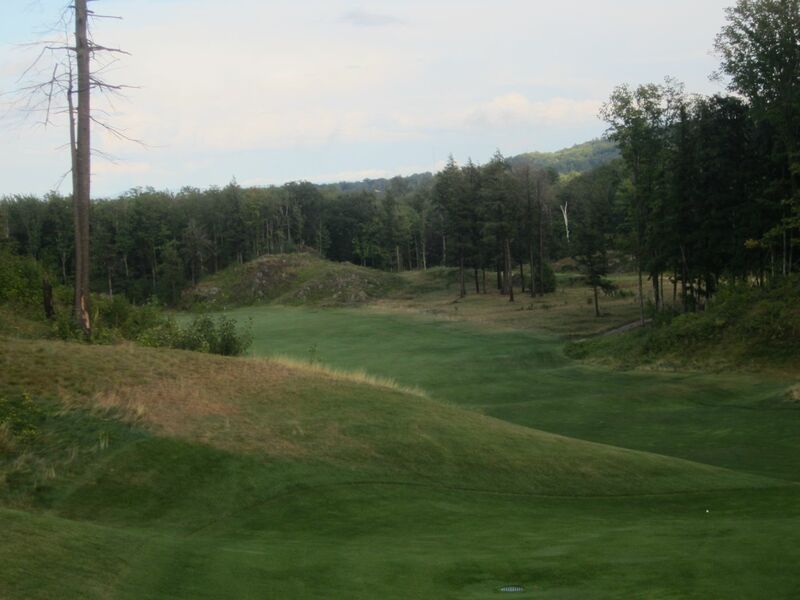 Combining the perfect course conditions of Sweetgrass with some of the dramatic elevation features of Greywalls, TimberStone is one of the most well laid out and maintained courses I have played. 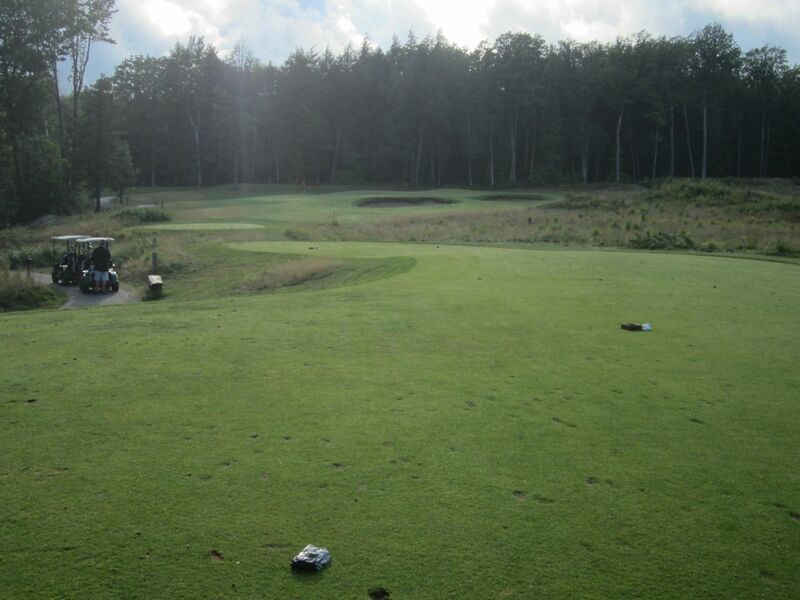 Golf.com ranks it as the third best course in the state of Michigan, while GolfWeek ranks it seventh. If it was in Wisconsin, it would be in the top seven here, too. Not only is the U.P. 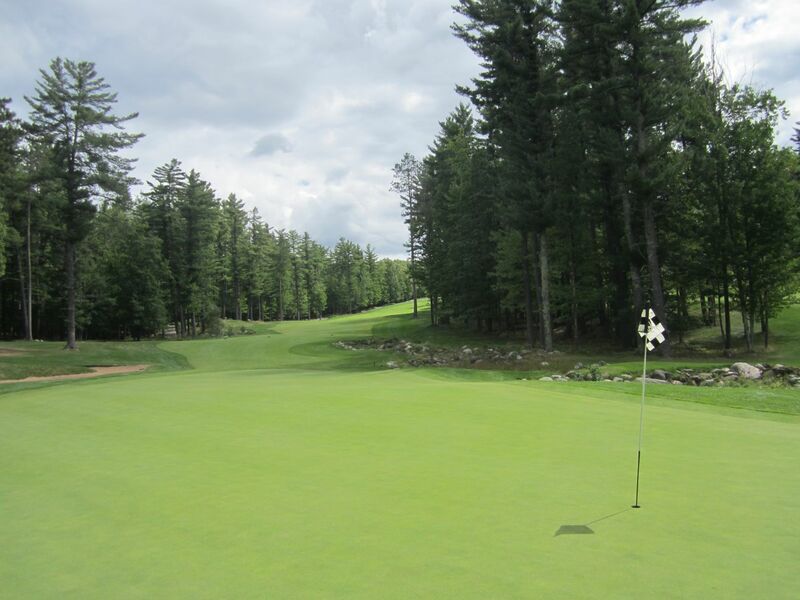 golf trip a phenomenal value, but it features three fantastic golf courses. I cannot say enough how much I am looking forward to next year’s trip. If I could play only one of them, though, which would I play? Probably Greywalls. But all three are great. I hit the driving range, which is very nicely done with fresh fairway grass and three target greens, followed by the chipping range and putting green. The practice green has very few areas to practice straight, level putts, and this was characteristic of the greens on the course, too. 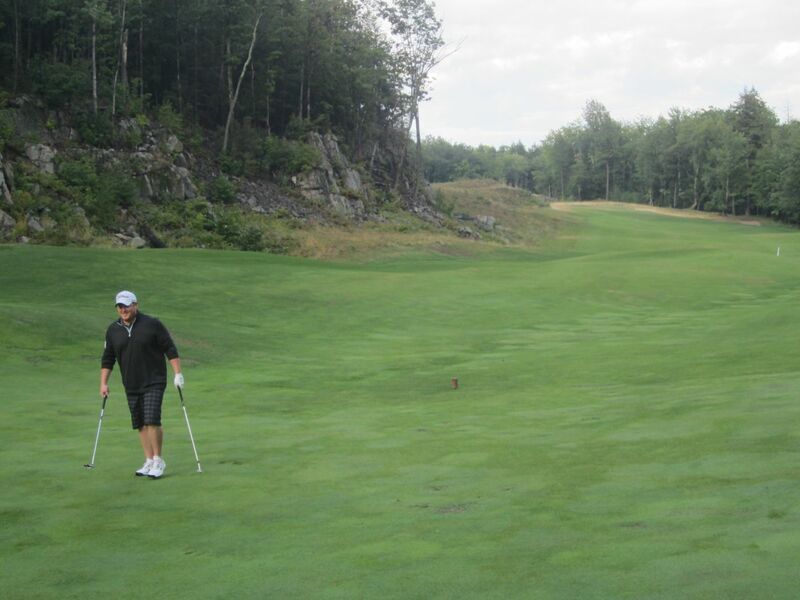 I would have never dreamed that a golf course could match the amazing experience of Greywalls. In its own way, though, which in some ways is a bit Greywalls-esque, TimberStone does it. 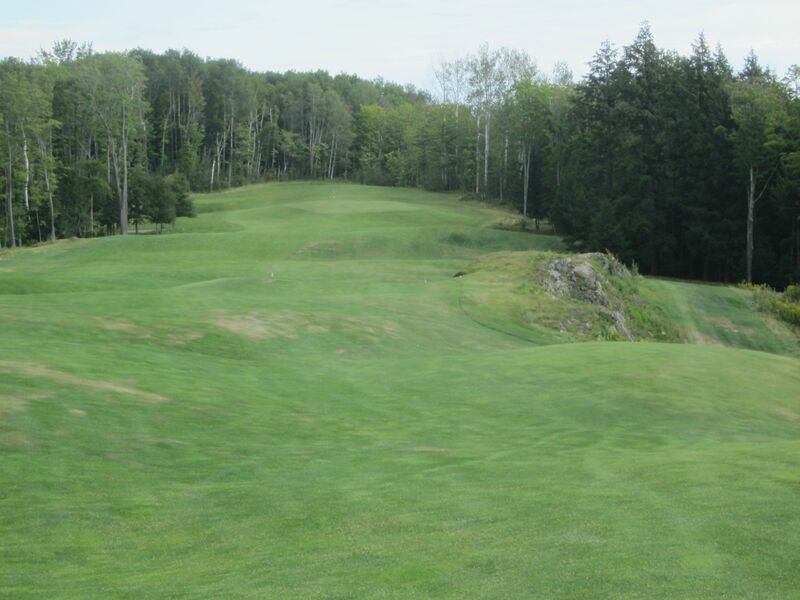 Combining the perfect course conditions of Sweetgrass with some of the dramatic elevation features of Greywalls, TimberStone is one of the most well laid out and maintained courses I have played. 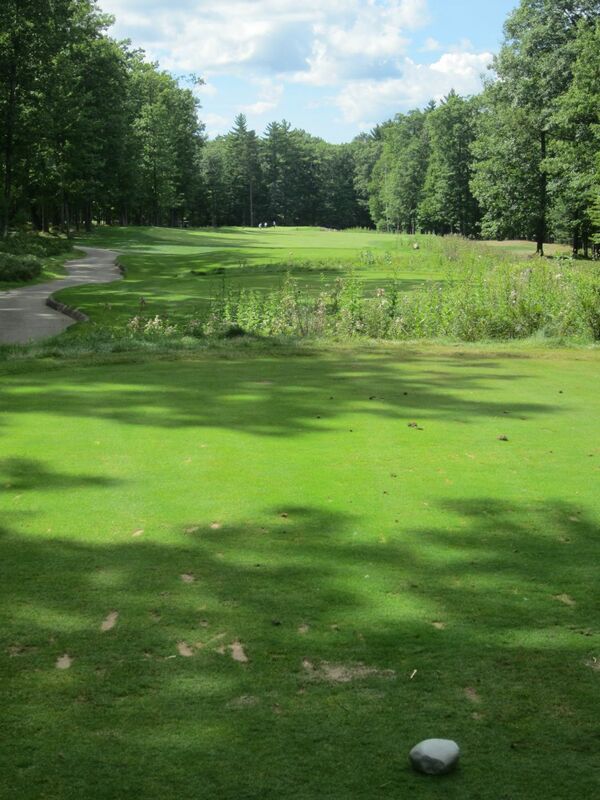 Golf.com ranks it as the third best course in the state of Michigan, while GolfWeek ranks it seventh. If it was in Wisconsin, it would be in the top seven here, too, and easily. From an overhead map view on Google, the course is etched out of dense forest. It is not quite as tight as the bird’s eye view would leave you to believe, but some accuracy is certainly required. The thing that makes this course scorable, though, is that it is not overly long: 6,937 yards from the tips, but much more playable at 6,533 from the boulder tees (second longest). Despite this somewhat pedestrian 6,533 yards, it still manages to carry a colossal slope of 144! 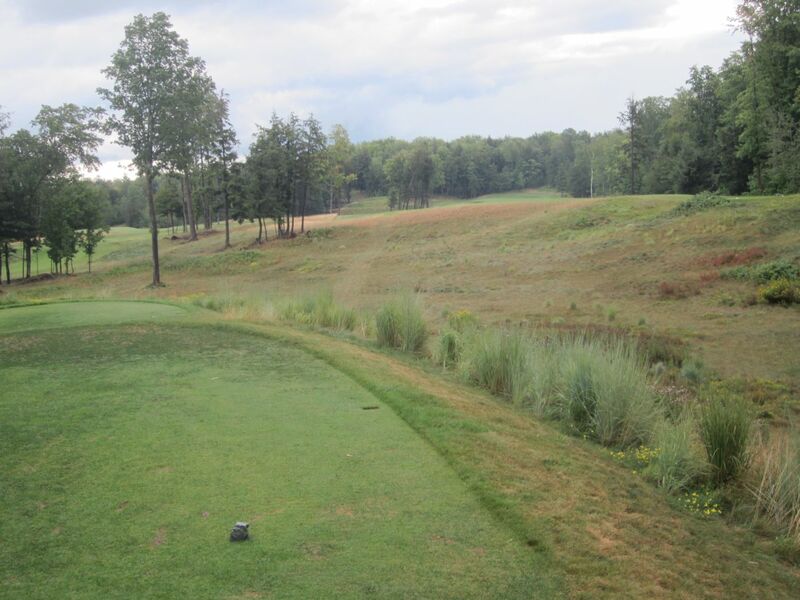 TimberStone severely penalizes errant tee shots, with deep woods and natural grasses. The rough is not overly deep – much less so than that found at Trapper’s Turn or Ironwood, for instance – but has a way of grabbing and opening the club face. The fairways are the nicest I had ever played on, only to be rivaled later by those at SentryWorld in Stevens Point, Wisconsin. The greens are typically large, and roll very true. In an order of fastest to really fast to fast on our trip, it would go like this: Sweetgrass, TimberStone, and Greywalls, respectively. The hole layouts at TimberStone are unique and challenging, with eight bona fide signature holes that all deserve to carry their own postcards. Some of my favorites include the fifth, sixth, eighth, ninth, twelfth, sixteenth, and the astonishing seventeenth and eighteenth holes. The 144 slope rears its head early at TimberStone, with a tree-lined tee shot on one with almost no room for error. 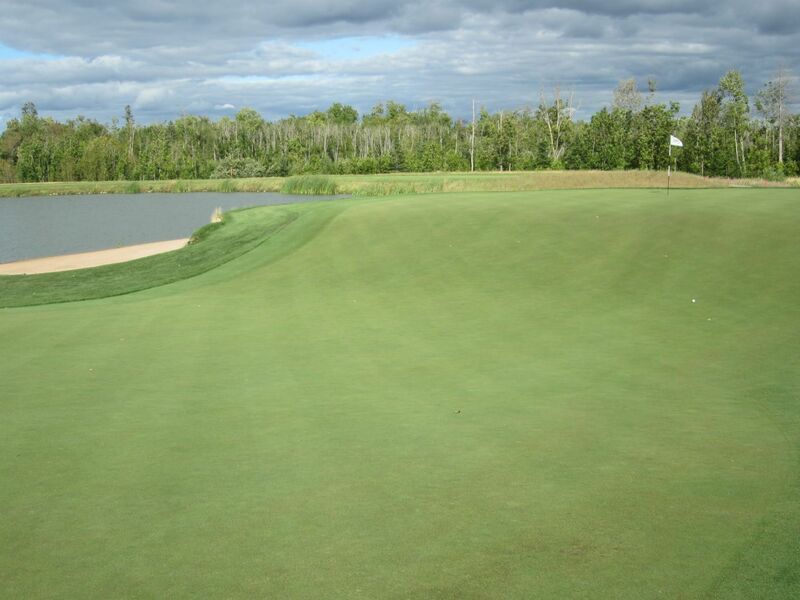 The hole turns left at about 275 yards, and finishes with a massive green that is fronted by a long sand trap. Like the first hole, the second works left to right but has a little more rough to catch errant tee shots. 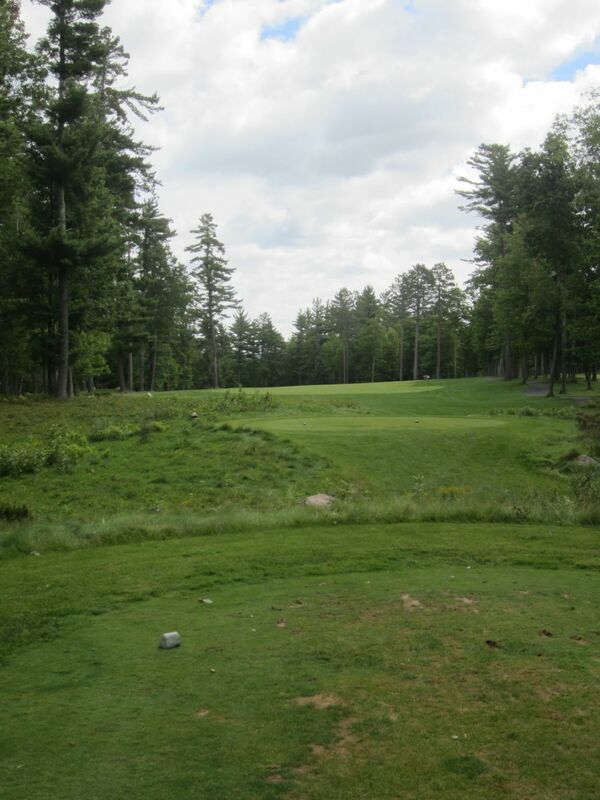 A long par four, it tees up well above the fairway and works back upwards to the deepest green on the course. Three played a little more to my game: A shorter par five (485 yards from the boulder tees) that runs left to right well within the driving area. The fourth and eleventh holes are very similar par threes. Each is straight away and tree-lined, and both have elevated greens. The fourth is considerably longer, though, at 173 yards from the boulder tees, while the eleventh is just 140. 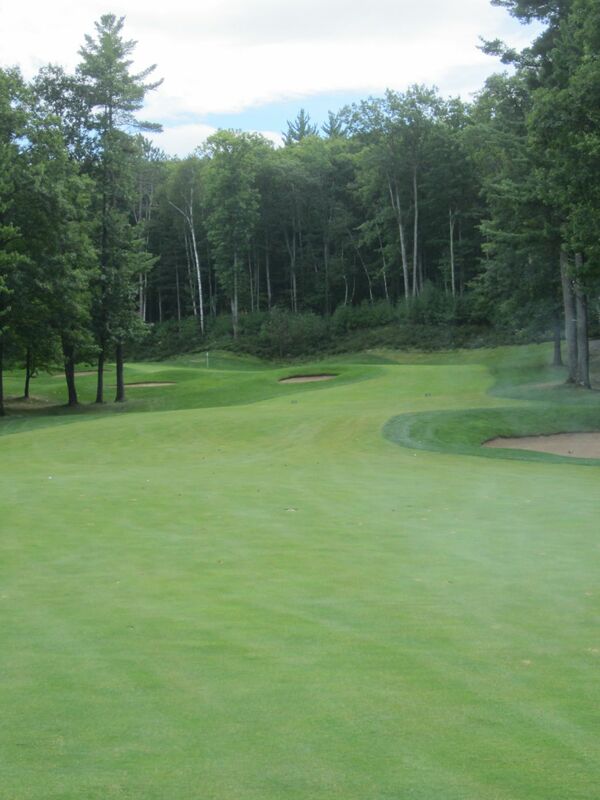 The eleventh also has two devilish traps that front the green to help defend an otherwise straightaway tee shot. This is where TimberStone starts getting remarkable. The tee boxes on the fifth shows just trees and a hint of a pond long and to the left. The right side is heavily wooded and is obviously the area to stay away from. 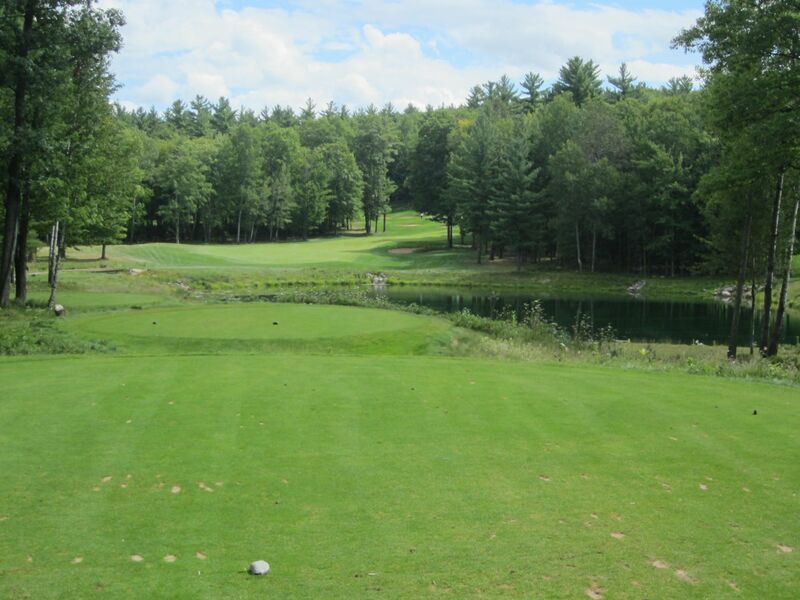 Following the tee shot, though, the left side of the woods opens up to a beautiful inland lake that runs the length of this 467-yard par five and leaves a big decision: Go for it with a long iron or wood over the pond, or lay up to an unbelievably narrow fairway that is at most 20 yards wide? 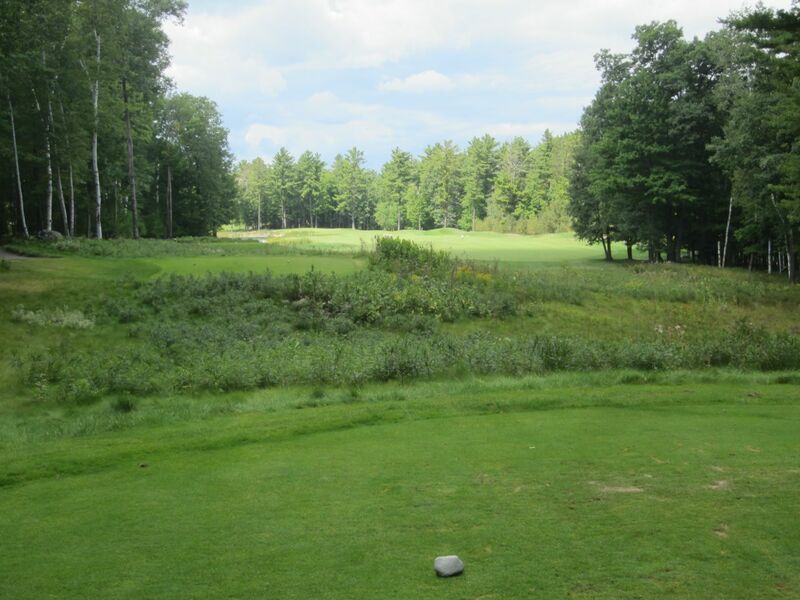 The right side of the fairway is mounded slightly, which is somewhat inviting, and the backside mounds of the green lead to deep woods and lost balls. The sixth plays to the opposite side of this lake, and requires a ridiculously straight tee shot that can be played straight away if long enough to carry the first portion of the water hazard. The right side is gone, so wail away and hope to find fairway. Alike the previous hole, the sixth finishes over water to a putting surface that is guarded in front and back by deep greenside bunkers. The seventh is a tough little hole. 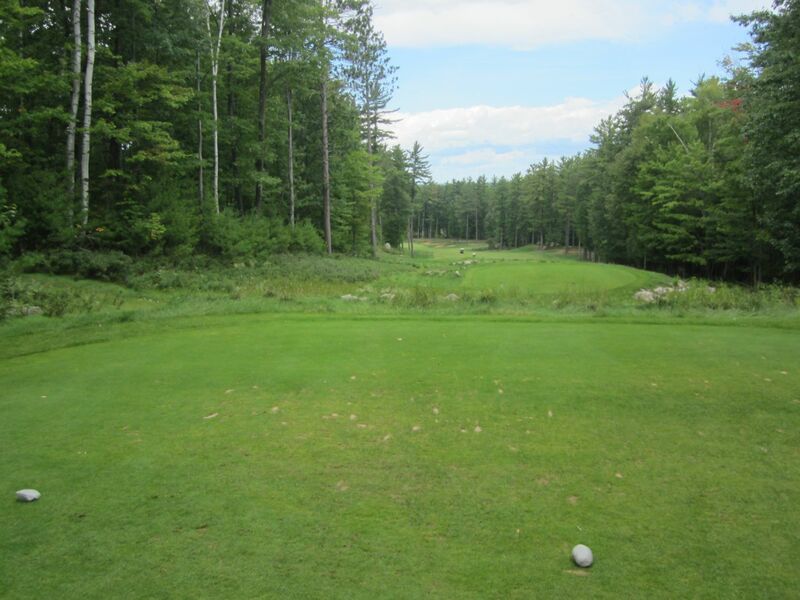 At 342 yards, it is certainly not long, but it is very tight and the tee shot is demanding. Driver is too long to hit here, so take something straight and find the middle of the fairway 200 yards away for a direct approach shot. 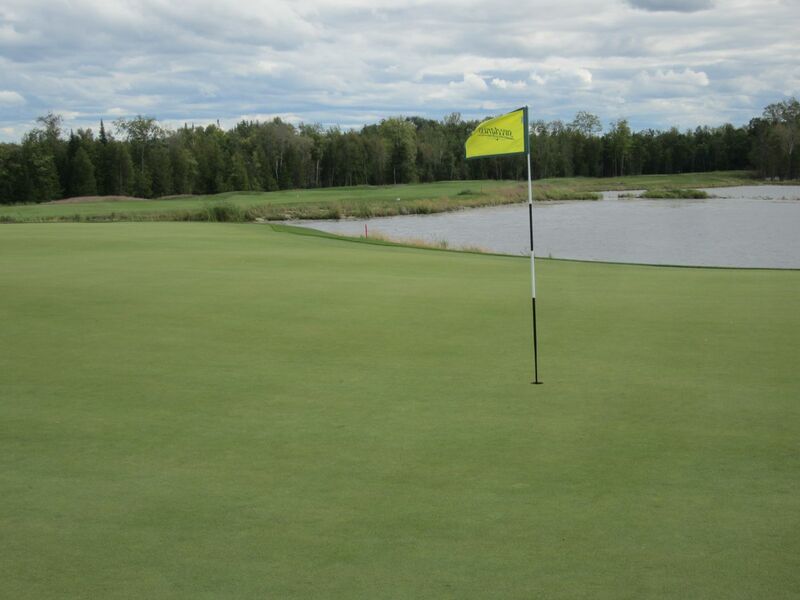 The green is shared with the twelfth, but separated by a considerable amount of rough, sand, and a back-side green connector. off to a large pond. Nine is a glorious par four. 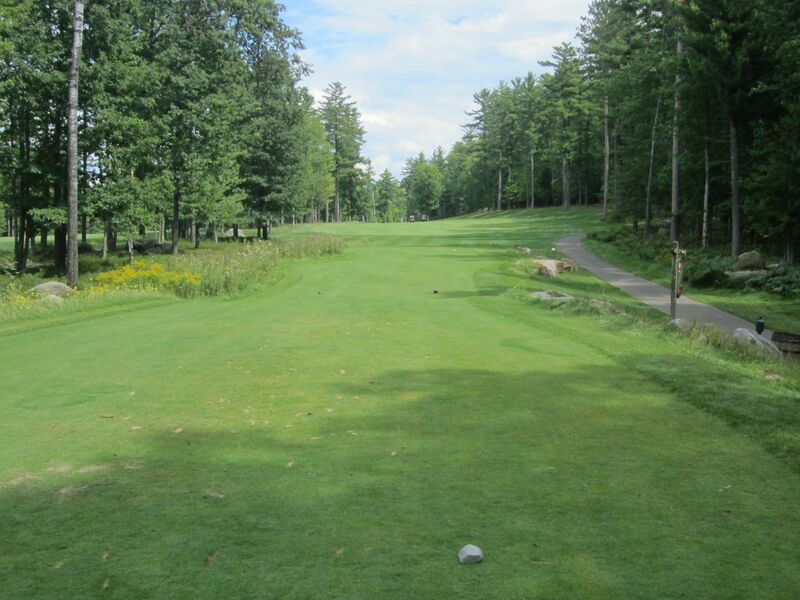 At 448 yards from the boulder tees, it is long and demanding off the tee. Anything straight will get a favorable bound down the hillside, while finding the tree line will make the hole extremely long. 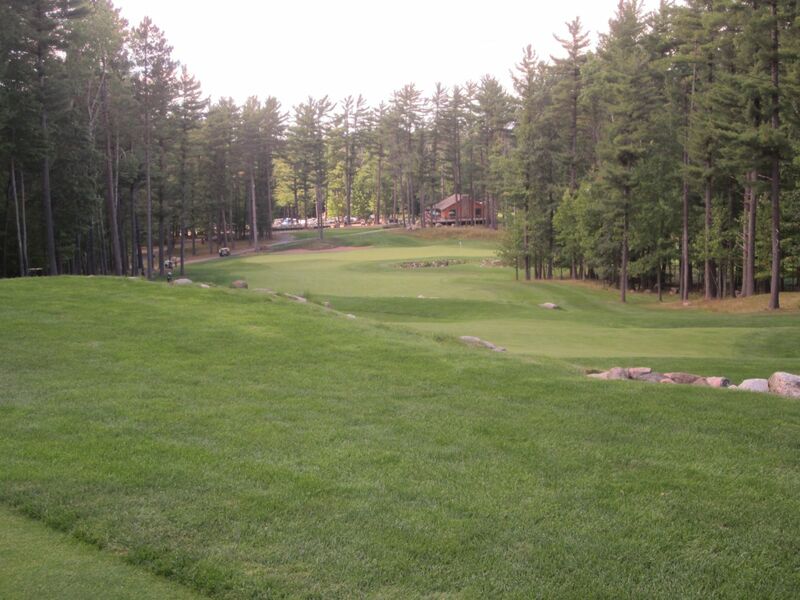 The ninth finishes at the clubhouse, with an enormously wide green that is shared with the eighteenth. 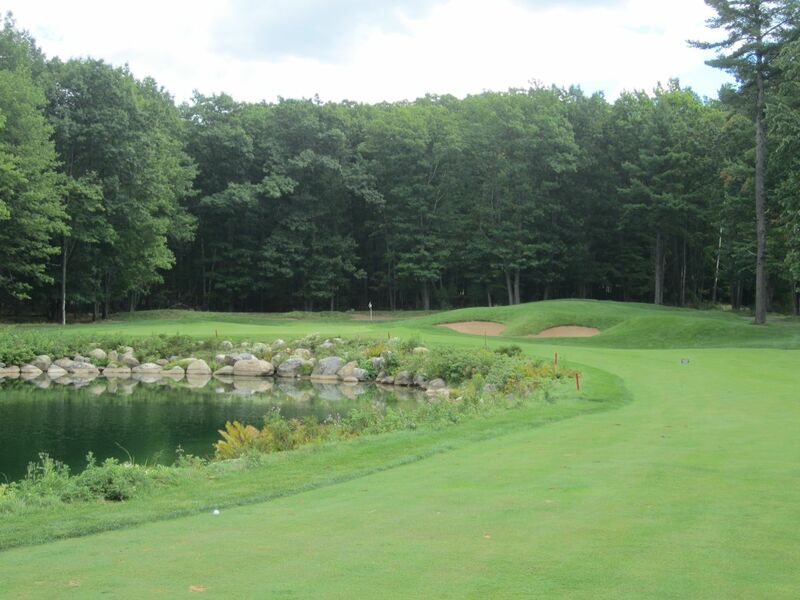 After the short par three eleventh, the par four twelfth is a remarkable short par four nicknamed “Amphitheater.” The pond right should be taken out of the picture by any long iron or wood, but driver cannot be played unless considerably drawn. Find the fairway and take an extra club or two for the uphill approach over sand. This is a beautiful par four with all kinds of trouble to be found. Thirteen, although tight, is a manageable par five. 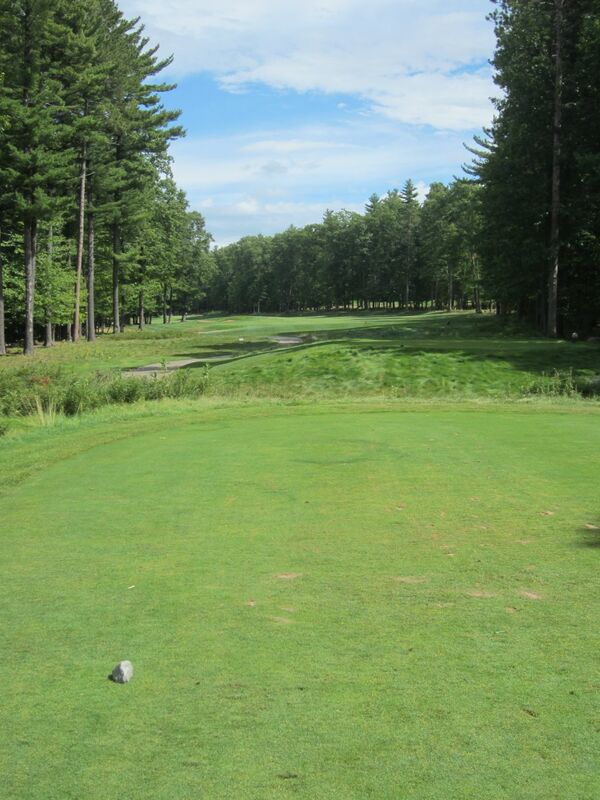 At 490 yards from the boulder tees, trees line both sides of the fairway that draws left in the drivable area. 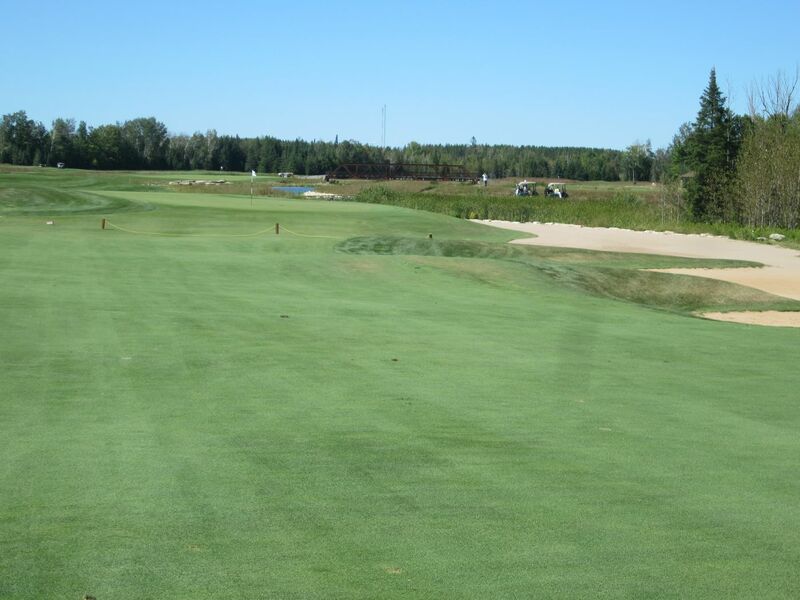 The green is bordered to the left and right by sand traps. The fourteenth is best characterized by its finish. A short par four (366 yards from the boulders), the green is small and located between trees to the left (which I found) and a lateral hazard that falls acutely to the right. Precision is key on this approach. 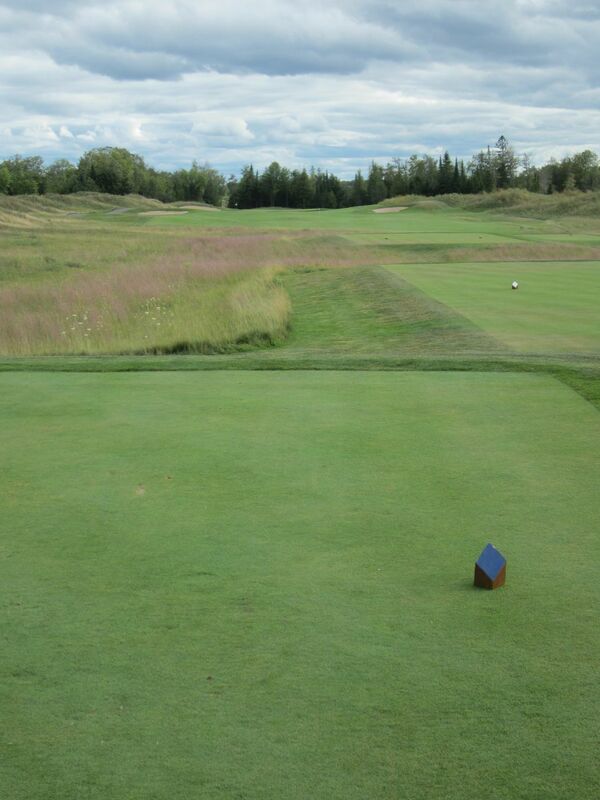 Fifteen is a fairly straight-away par four around 400 yards. Like much of the course, there is little room for error off the tee, and the green is short (17 yards from front to back) but wide. 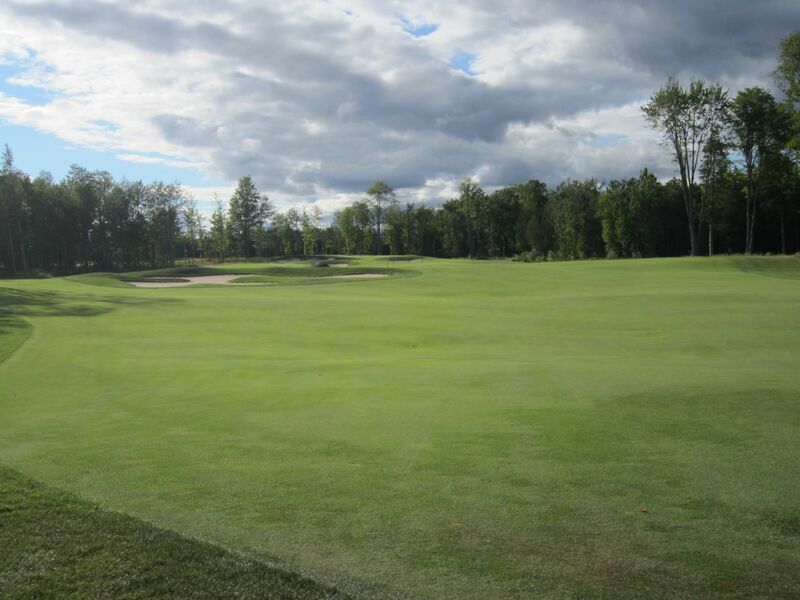 Sixteen is an awesome golf hole, with a wide fairway (for TimberStone) that leads to a huge uphill approach that is well above the deep right-side bunkers and fairway area. The fairway of the approach area runs laterally to this trap, and leaves hell to pay if bunkered. Seventeen: Wow. Not much else to say. This is the most highly elevated tee shot I have ever seen, and while the shear height implies at least two less clubs, the wind into our face made it considerably longer. I hit a five-iron on this 195-yard par three, and still wound up short (my five usually goes a little over 200 yards). 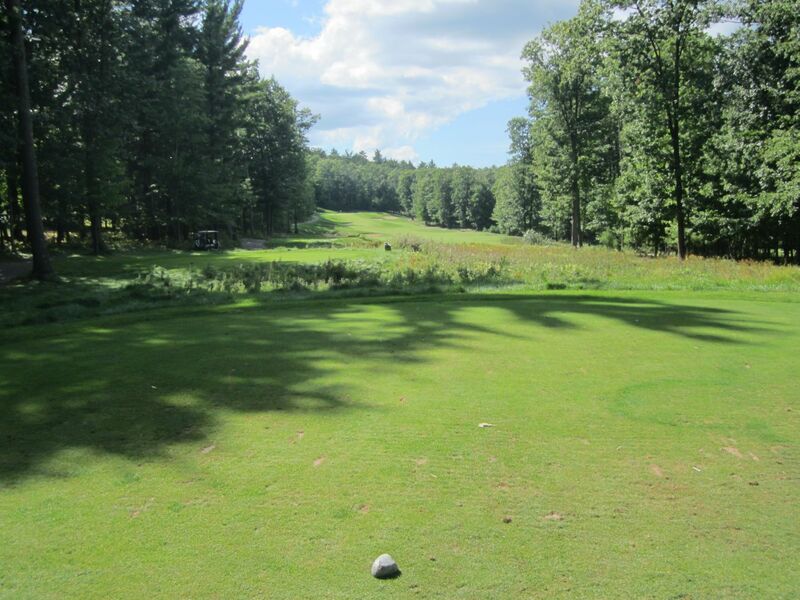 The ball seems to stay in flight forever on this beautiful, lofted golf hole. The green is no treat, either, with a narrow entrance to a bi-level green that drops from front to back. Following seventeen is one of the most awe-striking par fives I have ever played. 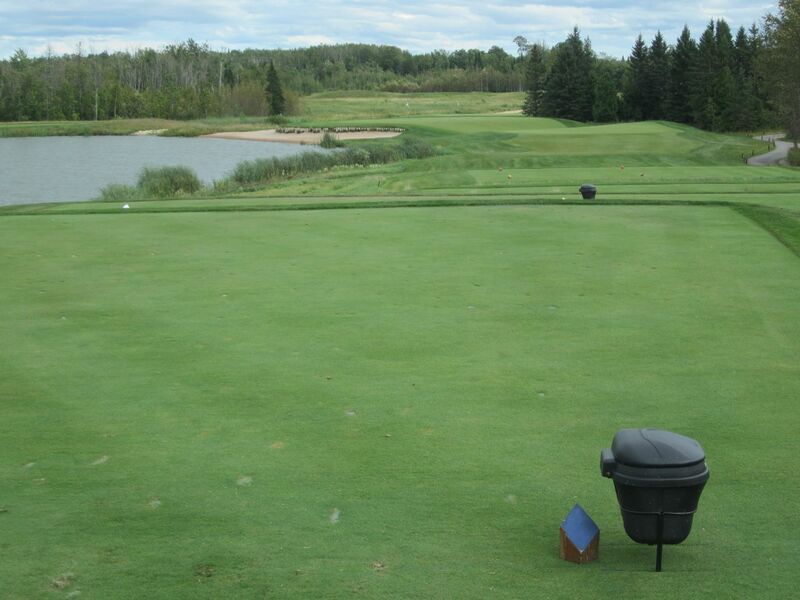 “Double Black Diamond” is played down a terraced ski hill that features a periscope on top that allows those about to tee off to ensure the driving area is clear before hitting. 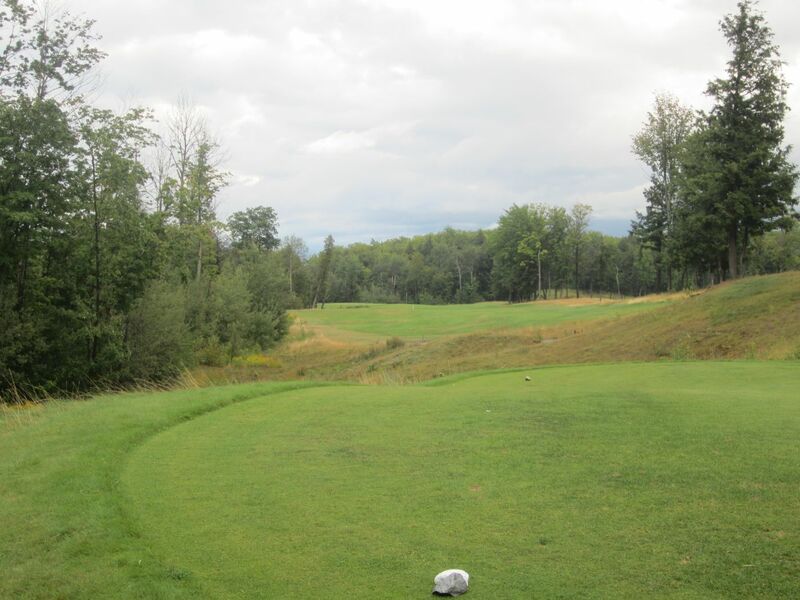 At 595 yards from the boulder tees, eighteen plays straight downhill to a wide green shared by the ninth and eighteenth holes (the fairways are otherwise separated by a tree line). Boulders terrace the landscaping of this hole in to three distinct fairway areas which require long, straight shots that will bound down the hillside. 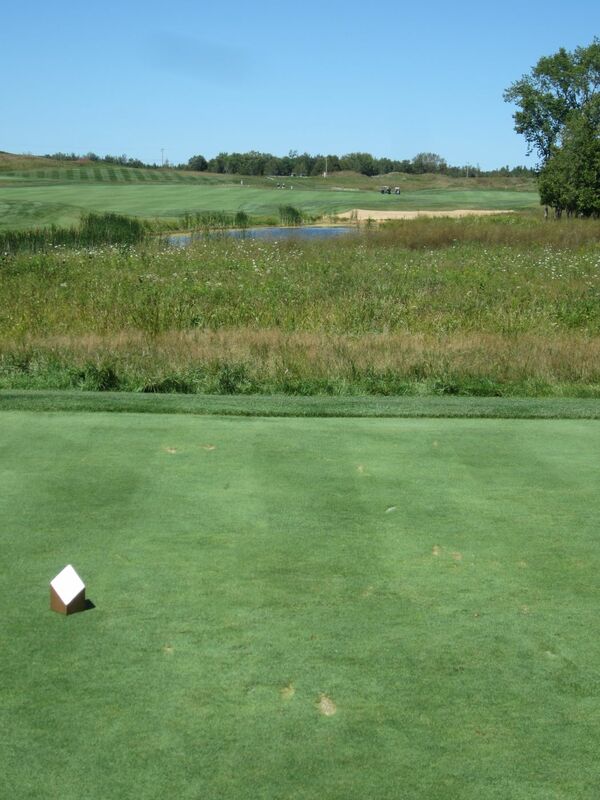 A small pond fronts the green in right, so aim for the back of the green to stay away from trouble. What a finish! 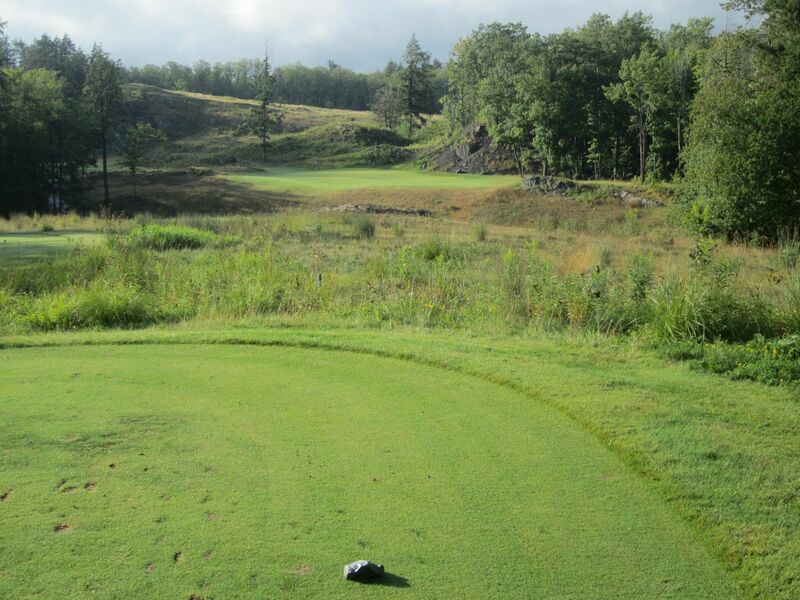 TimberStone ranks as one of the best all-around golfing experiences I have ever played. The conditions are remarkable, and although it is on the shorter side (6533 total yards from the boulder tees), it plays mercilessly with a second-to-back slope of 144 and rating of 72.9. These numbers are unbelievably high for a medium length course, and tell the story well about the types of shots you will be required to make to score on this course. Saturday morning of our U.P. golf trip began with a delicious two dollar breakfast at the Firekeeper’s Lounge in The Island Resort and Casino. Our golf package included a plethora of coupons which could be used for one meal per day, a drink and five dollars in slot credits per day. After breakfast, Mitch and I made our way up north to Marquette. About an hour and twenty minutes away, it was an easy drive and we found ourselves at Marquette Golf Club quickly enough. 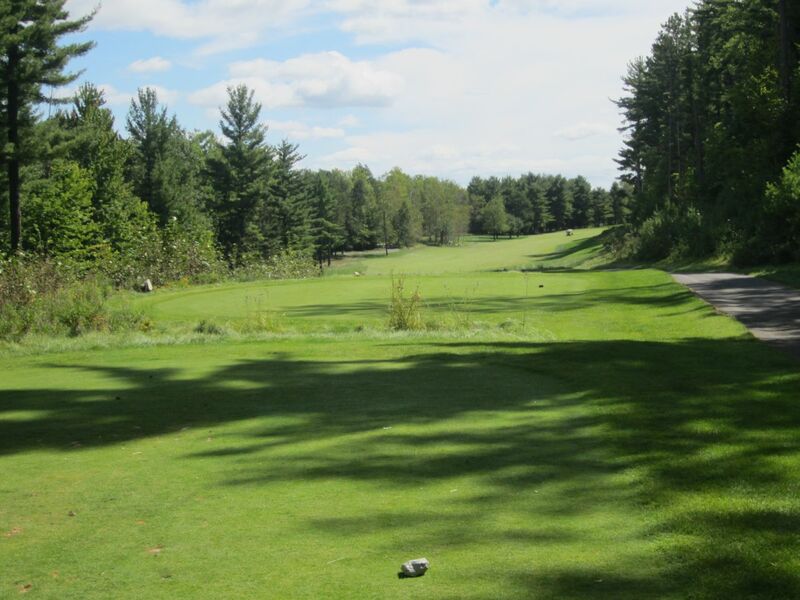 As a word of advice, “Greywalls” does not come up on GPS devices, so make sure to enter “Marquette Golf Club” for directions to the course. The entrance to the property is a little confusing. 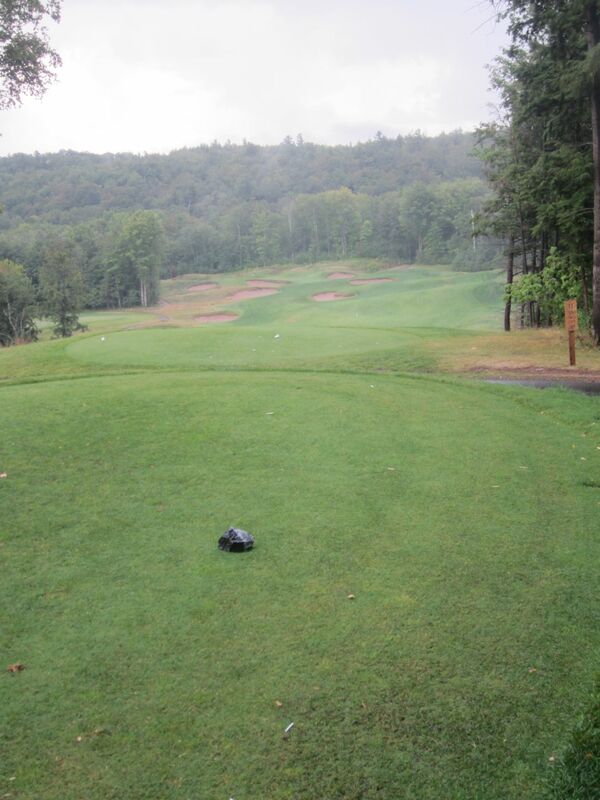 I have been hearing for years about mountainous terrain with unbelievable elevation and pristine course conditions. The entrance, though, showed the rolling terrain of the Heritage Course, designed by William Langford eight years after he and Theodore Moreau designed the Links Course at Lawsonia. I was uncertain we were at the right place, but we continued up the driveway past the quaint clubhouse to the small pro shop. I asked the bag drop if we were at the right place, and he replied that we were and that Greywalls is actually a short golf cart drive away. 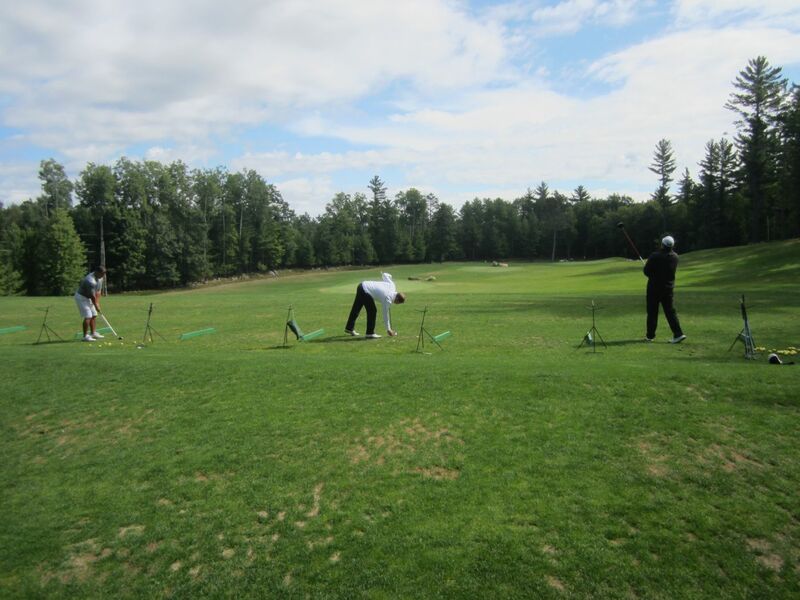 The driving range and practice facility are minimal at this time, but Head Golf Professional Marc Gilmore informed me that plans are in the works for new facilities that will be dedicated solely to Greywalls’ course and location. With a down economy, this could be a couple years in the distance, but will happen soon enough. I cannot say enough how much it would mean to this area’s economy to get the mines opened up again. I will avoid getting on any conservative soap boxes at this time, though. Marc was incredibly accommodating with our group, setting up hole contests for long drives and putts, and closest to pins on par threes and fours. He and his staff are some of the nicest, most welcoming golf professionals I have met since starting this venture. While Marc is seemingly soft-spoken and welcoming, the course is not. We left the practice facility about fifteen minutes prior to our first tee time, and began the journey to the legend that would become Greywalls. Down a long, meandering pathway, the drive led us through dense woods and around bends, up hills and to our first view of the championship course. We stopped beyond the green of the seventh hole, where Marc had us check out the location of the 150-yard marker in the middle of a steep downhill embankment that was littered with rock cliffs and drastic fairway mounding. 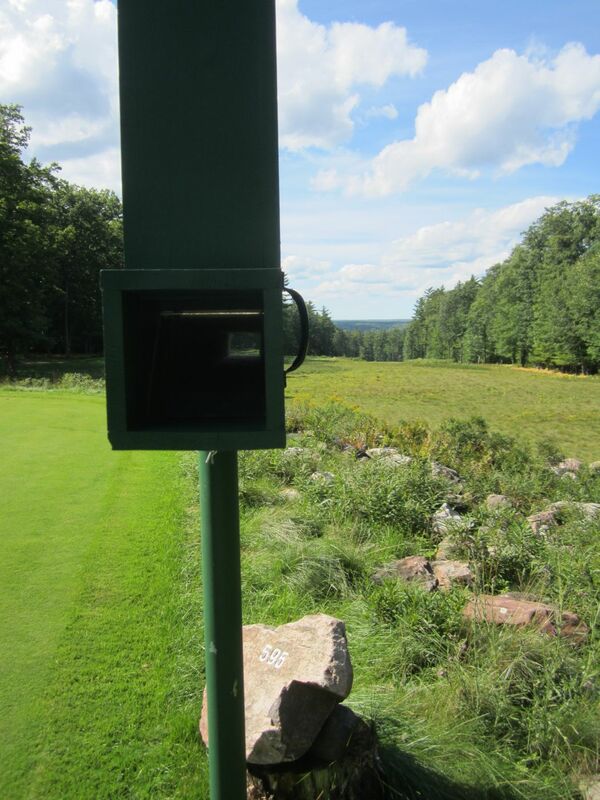 This is the only 150-yard marker that is not visible from the tee boxes. My friend, Greg, got out of his cart and asked me if my shorts were still clean. Gross, sure, but almost a valid question considering the circumstances. Greywalls is “wild and wooly,” Marc explained, and we would find out all about that as the round progressed. 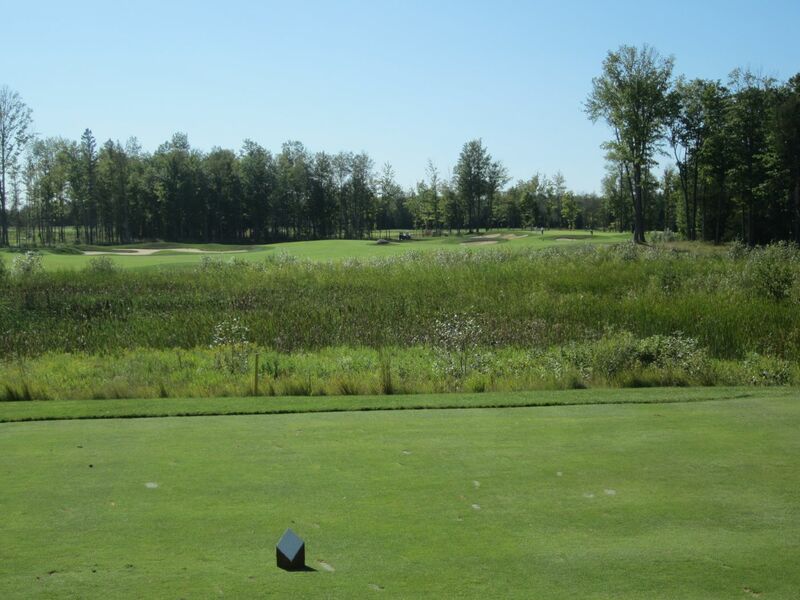 Designed by Mike DeVries, the course opened seven years ago and has deservedly received high acclaim from golf critics and enthusiasts, including a number two ranking among public courses in the state of Michigan. Very little of the 1830’s gold and silver mine land was moved in the cultivation of this course, which is noticeable in every aspect of its layout and results in impressive character that is like nothing I had ever seen. We got back in the carts and made our way up and around a sharp hill, arriving at the starter’s building and snack shop that is located between the first and tenth hole tee boxes. If the green area of the seventh hole was not impressive enough, the view from the tiny practice green located here took my breath away. Overlooking deep woods and Lake Superior on the horizon, the vista from this vantage point sprawls seemingly forever. The picture-taking began. I would go on to take 164 of them, and almost all are frame-worthy. This is not intended to say anything about my photography skills, but instead speaks volumes of the incredible scenery and natural beauty of Greywalls and its terrain and layout. The practice green is quick. Not quite as quick as the greens at Sweetgrass, but very fast… This could be a long day. My group would tee off first, and the driving area on one is intimidating. A huge downhill landing area is substantially mounded and runs from left to right. It seems we are at the top of the world. 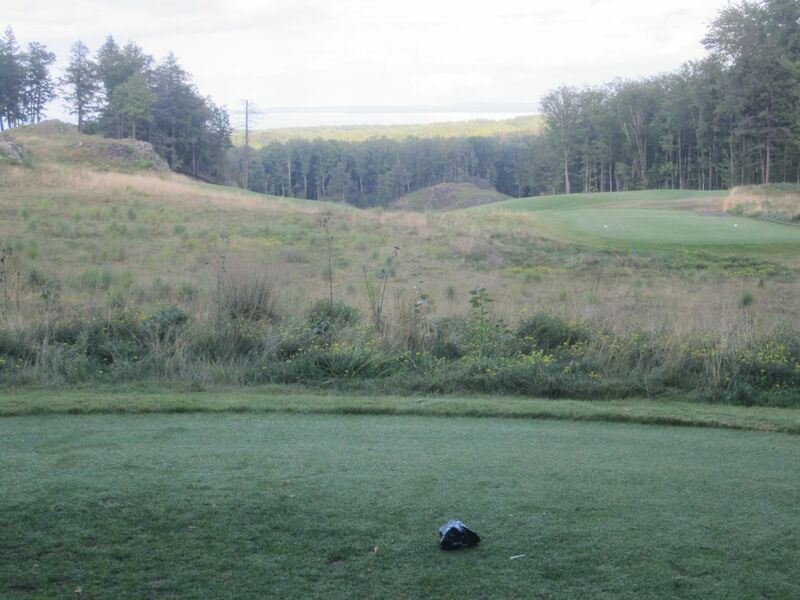 Do not be intimidated by this tee shot, though. Swing away with all you’ve got. Find the fairway and then hit anything in the bag that goes straight. The downhill fairway will carry it as long as it needs to go. This is where the first hole gets tricky: The green is highly elevated over its front entrance, and a back pin location was just a few yards from a sharp drop-off to a backside deposit area. 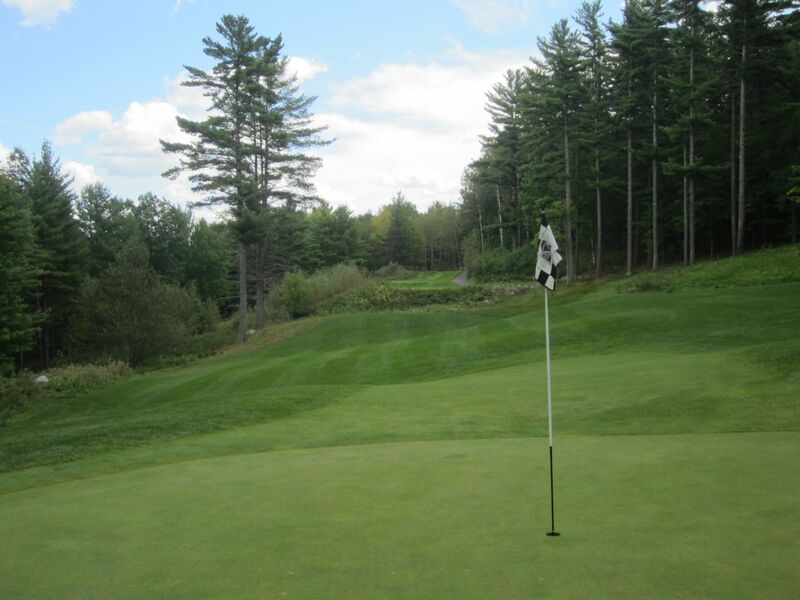 The green on one is representative of most at Greywalls: Extreme mounds and edges that will shepherd misread or over-hit putts off the putting surfaces. Two is one of the trickiest holes on the course. 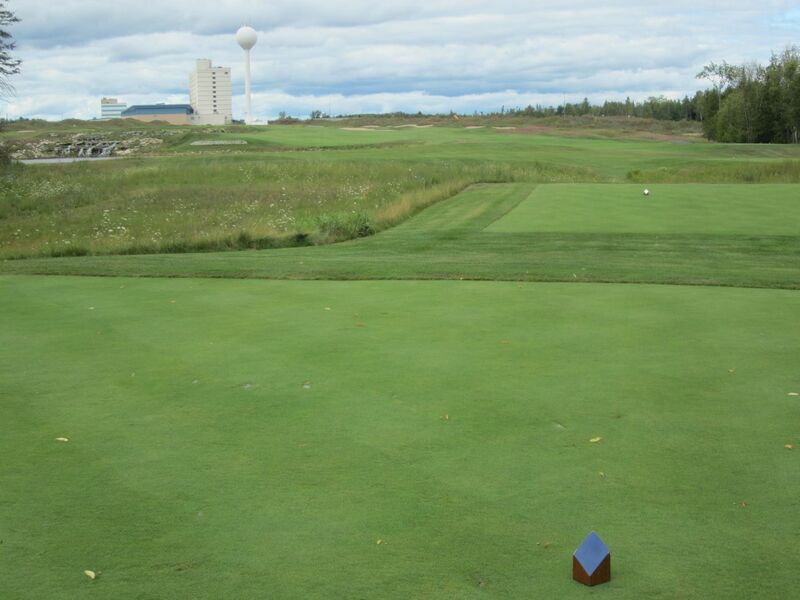 Look for the 150-yard marker in the middle of the fairway, and hit to it. 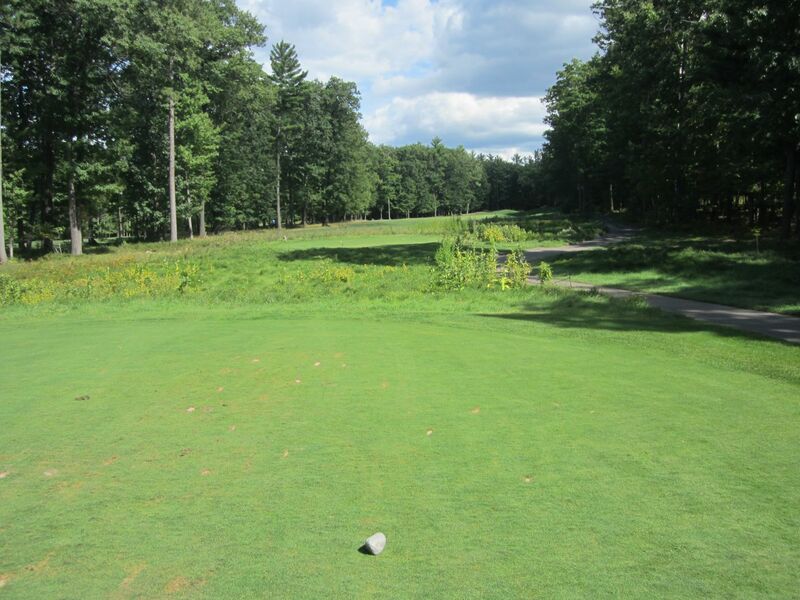 Do not get greedy on this tee shot, as the right side drops off severely to the woods, and even if it does hold will leave no shot at the green. With a front-left pin location, the green was quite possibly impossible. The green sweeps from a high left side vertically down to the front right. A huge hollow fronts the right side of the green, and a tall mound defends the left side. I actually hit a drawn eight-iron to this mound during my second attempt at the hole. The ball almost stopped on the side of the mound, rolled slowly down right to the front-left putting surface, then down the hill and off the right side of the green entirely. 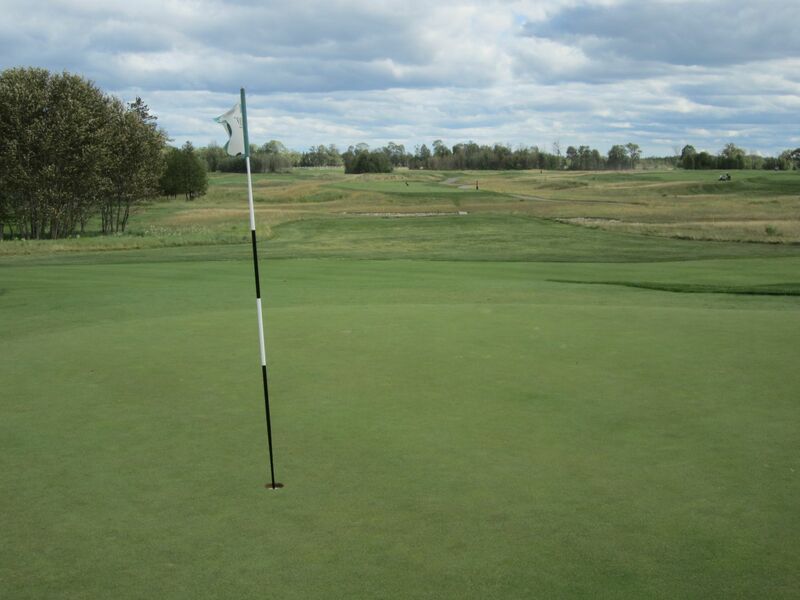 Do not expect to hit this green in regulation; just be happy if you’re close and hope to one-putt! 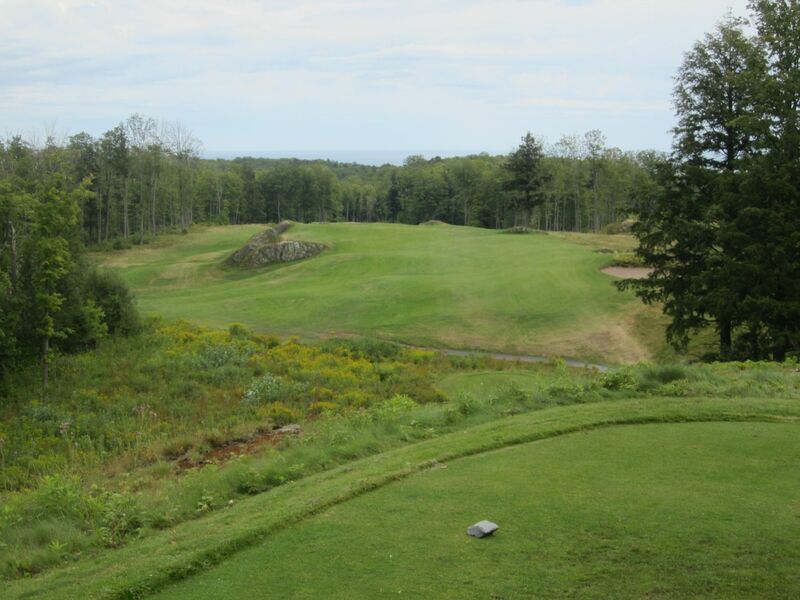 Three is the first of the par threes at Greywalls, and features a medium-length tee shot over a waste area to a green that is defender by sand and a disaster of a back-side that leaves an almost impossible chip. The sand here is dark – the U.P. sand minerals look almost like stone – but it is actually quite soft and playable. 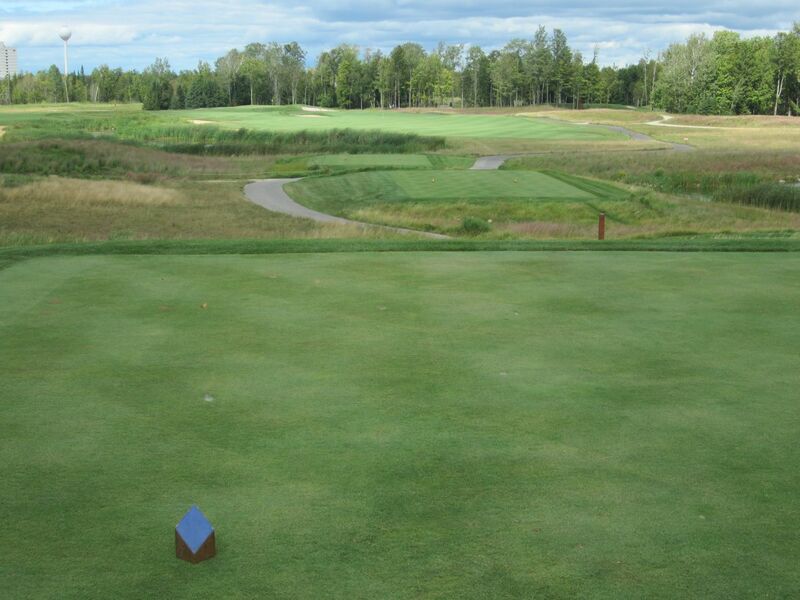 Look to the right of the hole on the third green and see what looks to be the most intimidating tee shot of your life. The fourth hole tee boxes are elevated, and the entire left side is bordered by woods and steep cliffs. A mammoth hill in the middle of the fairway leads to a lower right side fairway, though, that can be played and provides bailout for a soft fade. Use this area, as anything left will not be found on the hillside. 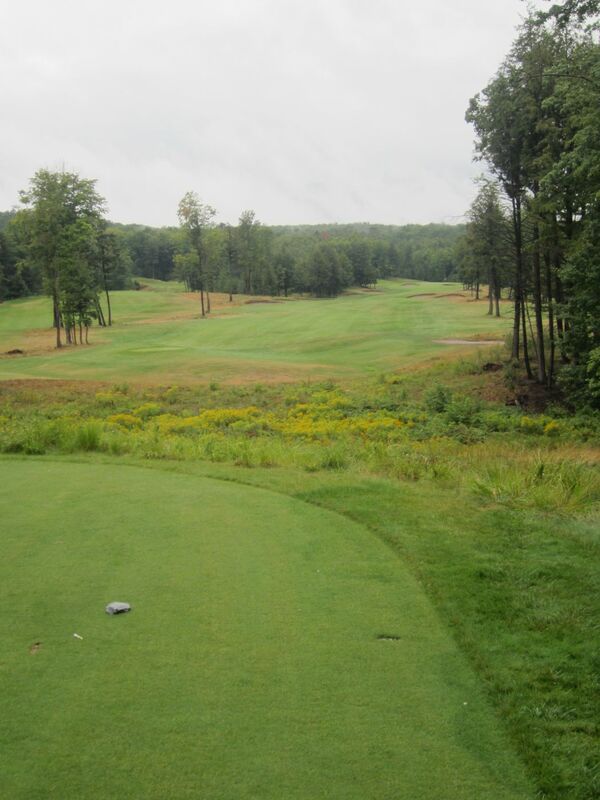 While the tee shot on four is intimidating, the tee boxes on five offer a mere sliver of an entrance to a highly elevated fairway that runs softly right to left and provides no room for error. 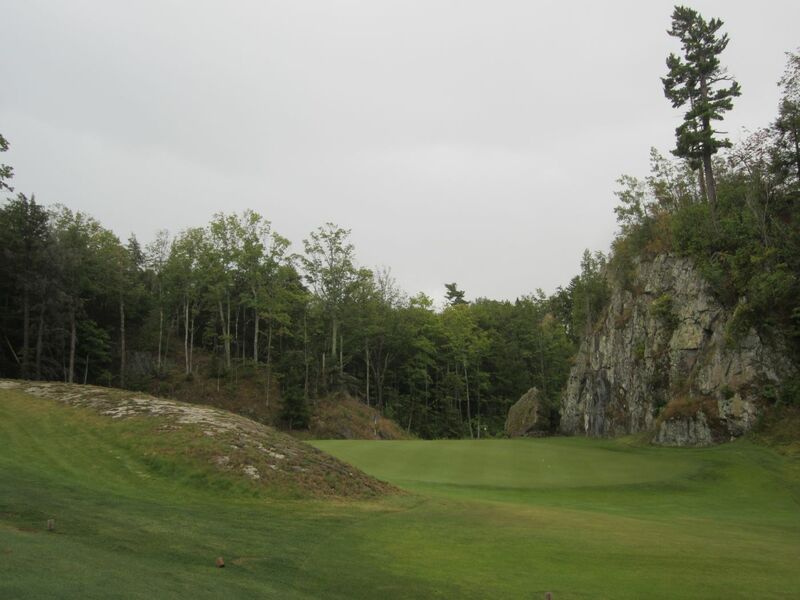 A huge cliff wall makes up the left side of this entrance, but can be carried for an effective tee shot. Driving up the hill to the fairway affords a beautiful view of a green that is guarded on the right side by a majestic rock wall. 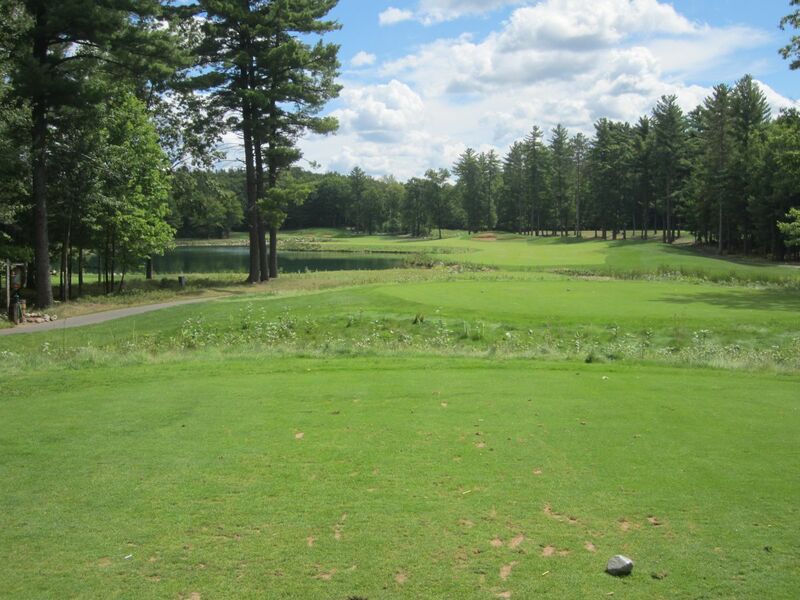 At just 312 yards from the granite tees, this hole is very scorable if played from the fairway. 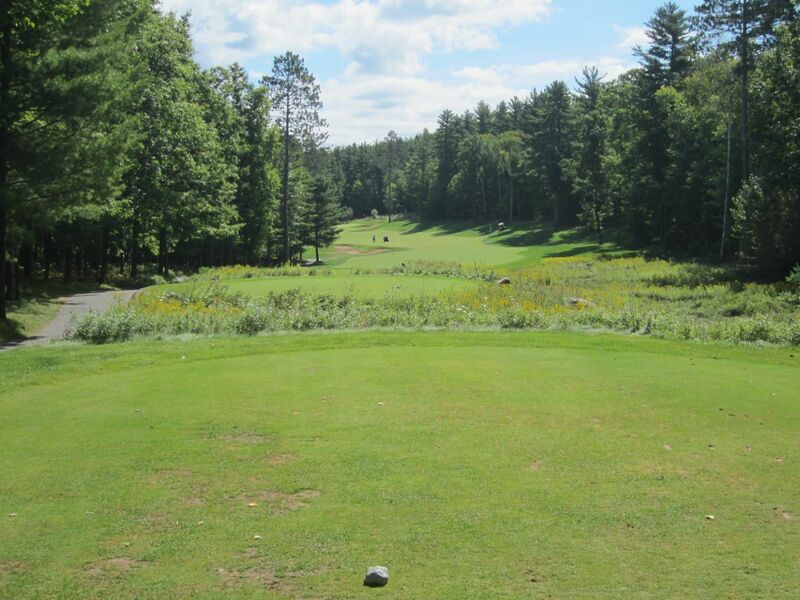 Be prepared to be awed by the sixth hole. This is, quite simply, the most beautiful par three I have ever seen. Bar none. At 178 yards from the highly elevated tee boxes, the tee shot plays over a deep chasm that must be carried, to a putting surface that is just two feet above the tee boxes (from the black and blue tees; the white tees would be much more difficult here as the tee shot is then considerably uphill and blind). I am only guessing here, but the canyon between the tees and green must be close to a hundred feet deep. I would be very interested in knowing what the actual depth is. What I do know is that this hole is absolutely stunning, and pictures do not do it justice. If the tee shot is not harrowing enough, the green breaks as heavily as any other on the course. This stretch of holes on the front nine at Greywalls is without a doubt the single most incredible stretch of golf holes I have ever played. Almost every hole has a wow factor that caught me off guard again and again, and I found myself instinctively laughing at the absolute glory that was on display. The seventh is another great example of this wow factor. 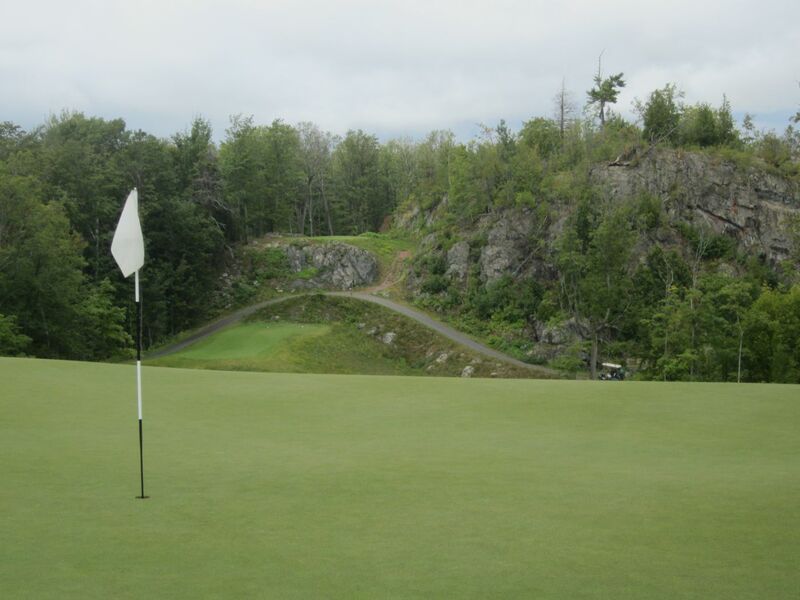 The elevated tee boxes look out over a huge fairway that is littered with random cliff and rock formations. Greywalls is majestic and beautiful, but far from fair. 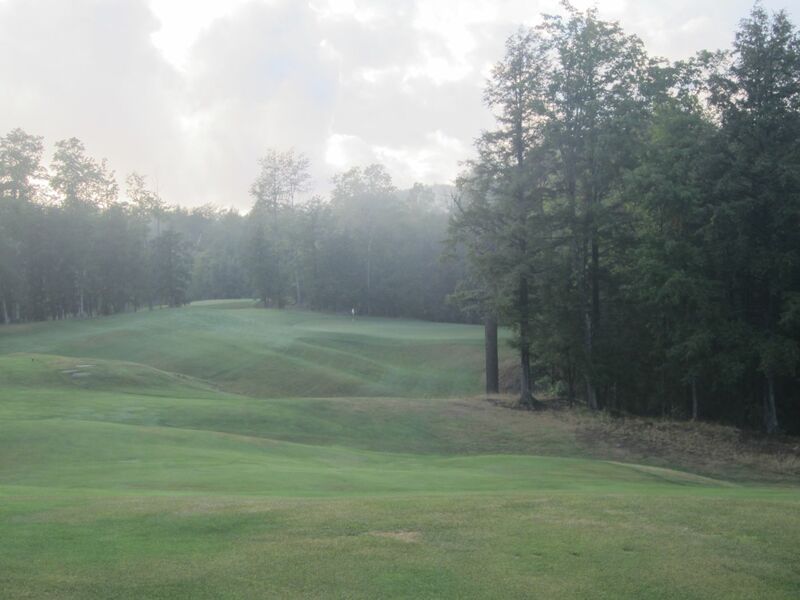 Great shots to the fairway are likely to hit rock faces or cliffs, and bounce in any direction, or settle in deep collection areas at the bottom of ten foot tall fairway mounds leaving blind shots from the short grass. Even lies are rarely found, and shots from the fairway are typically played above or below in the stance. 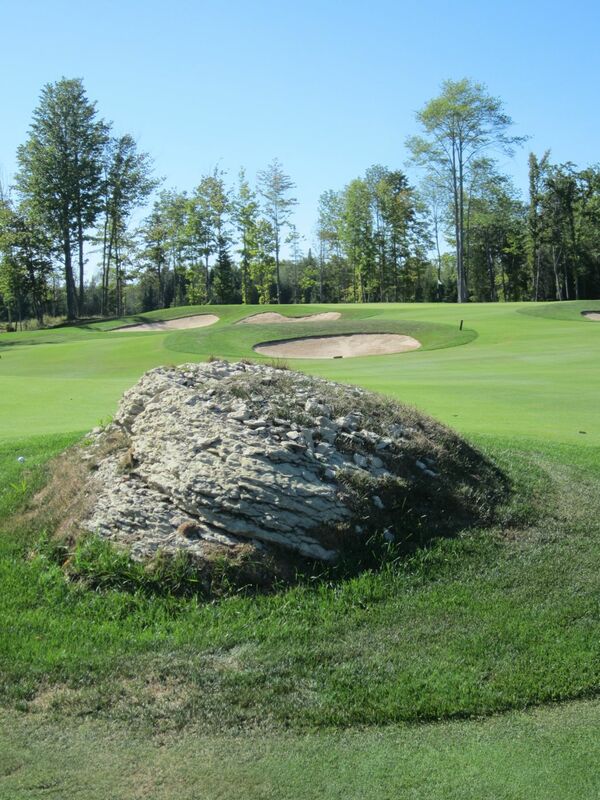 The second shot on the seventh is played down a steep hill that is again beset with large rock surfaces. Avoid this area at all costs, and hope instead for a solid shot over it all to the green. Eight looks tight from the tee boxes, with woods left and fairway traps and fescue right. It is more open than it looks, though, as the right side is fairly playable, and errant shots hit there can be easily found. 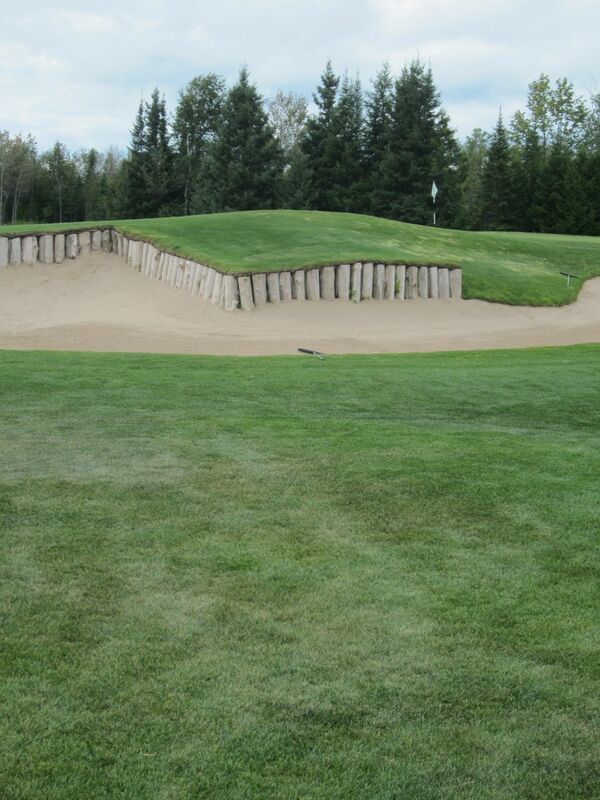 Avoid the traps on each side of the bunker here for any chance of par. 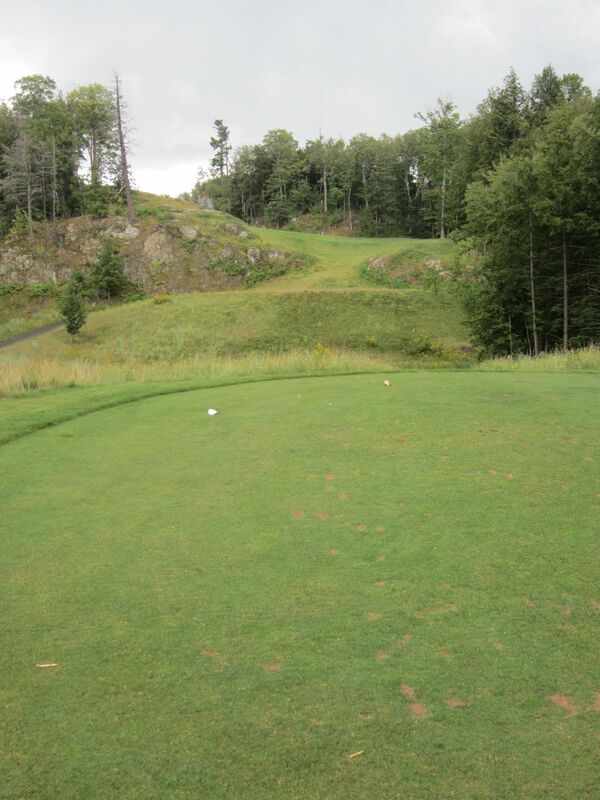 I put my drive down the fairway, and was so relieved I forgot my camera on the rocks behind the granite tee boxes. Thunder and lightning was starting to build. The skies were dark, and rain was soon on the way. Nine ends this unbelievable stretch of holes on the front side of Greywalls. 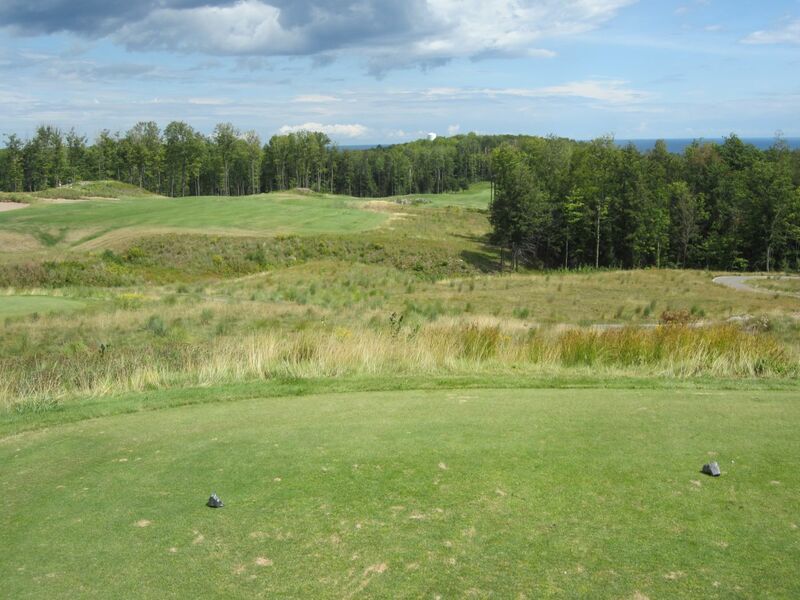 With elevated tee boxes, Lake Superior was again visible on the horizon. The tenth hole fairway can be used for bailing out. The approach here is as delicate as any at Greywalls. The left side of the green area drops off in to almost oblivion, and the right side is lined with tall pines that we would use to wait out thirty minutes of our impending storm delay. We were determined to finish off the front nine before taking shelter at the half-way house. This turned out to be a bad idea, as making the turn would mean our rain checks would be cut to nine holes. 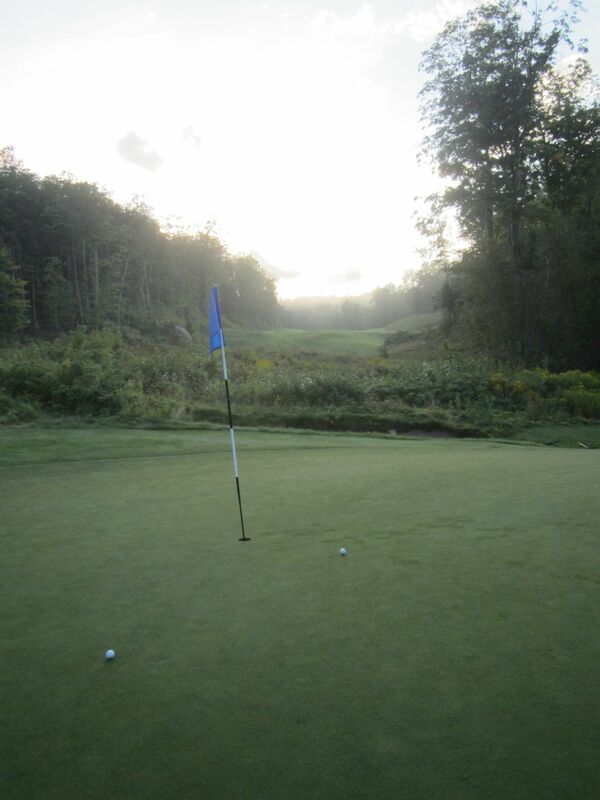 I drew a beautiful shot to the front of the green and three-putted up the steep vertical slope. We grabbed hot dogs and a beer, and stood under the tallest trees on the tallest point of the mountain. The hot dogs were delicious, by the way. You will not be disappointed in the concessions. With everything else going on, I realized my camera was still on eight. I found it on the same rock I left it on, and although it was wet, it worked perfectly. It turns out I am lucky sometimes, after all. A half hour in to the rain delay, we were welcomed in to the snack shop and found ourselves with the starter in a six by six room for an hour with the starter and eight guys from our group. It took another half hour to realize they had whiskey and beer for sale, and our moods then obviously started to elevate as we watched the weather forecast and warmed up. After a front nine like that, there was no way anybody in our group would be content in heading back to Harris early. Besides, what good is a rain check for a course in the U.P. going to do us in mid-August? We were happy to see the sun emerge for a minute or two, and soon after the rain came to a halt. My foursome hit the tenth hole tee box, and at last we got the back nine underway. 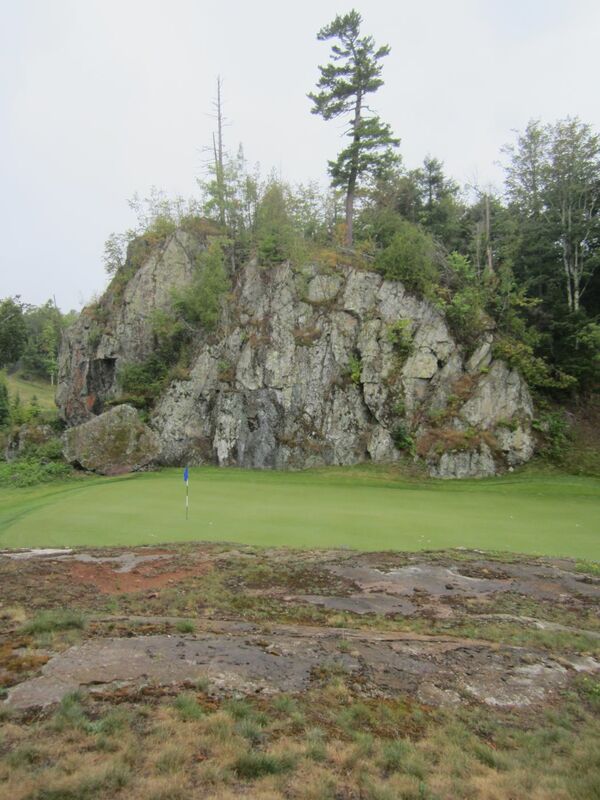 Ten can be played anywhere right of the rock walls that line the left side of the rough area. A false front runs downhill to the green, but adds ten to twenty yards to an approach that looks much easier than it is. Eleven is a fantastic, and challenging, golf hole. From extraordinarily high tee boxes, the fairway is mounded so drastically that no matter where the tee shot is hit, chances are there will be no view of the green. 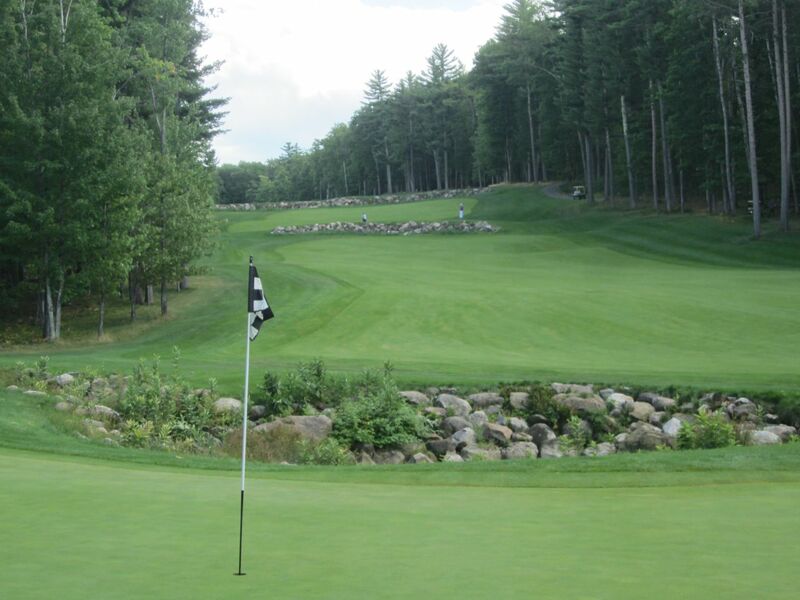 At 388 yards from the granite tees, there are eight sand traps in play. Drive to the fairway and then hope the second shot is headed in the right direction. The three greenside traps are deep, but the green is huge and can be easily blasted out to from them. 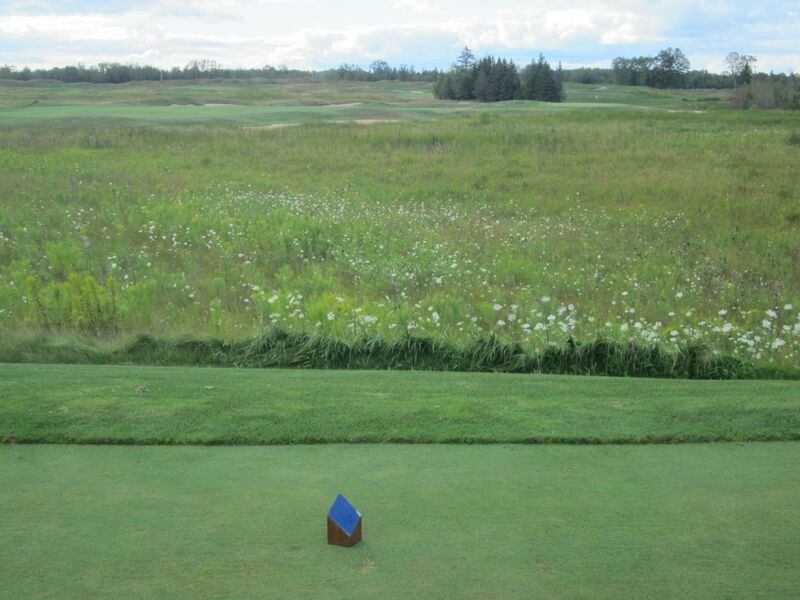 The green on the thirteenth is probably the toughest area of the hole. A 534-yard par five, it is mostly straight away, but can leave some extremely difficult putts on a putting surface that bends and breaks in all directions. The fourteenth gave our group some pretty big challenges. While the left side of the fairway provides the easiest approach to a tough green complex, the right side leaves a longer shot. My friend, John, found himself on the left side and started noticing something large moving in the bushes just feet from him. Startled, he noticed a two-foot-long porcupine moving through the brush in the opposite direction. Wild and wooly is right – or prickly. 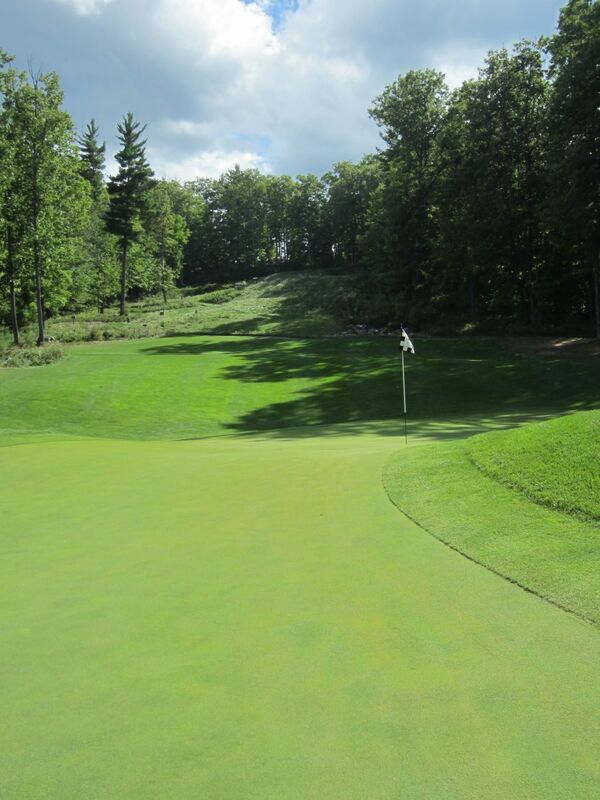 The green on fourteen is very highly perched above the approach area, and the only safe shot is to the middle. A long par three, the fifteenth sets up similarly to the third hole. Notice, though, that the wasteland in between drops significantly from the playing level to a deep canyon. This is not a hole to hit a tee shot fat on, like I did. 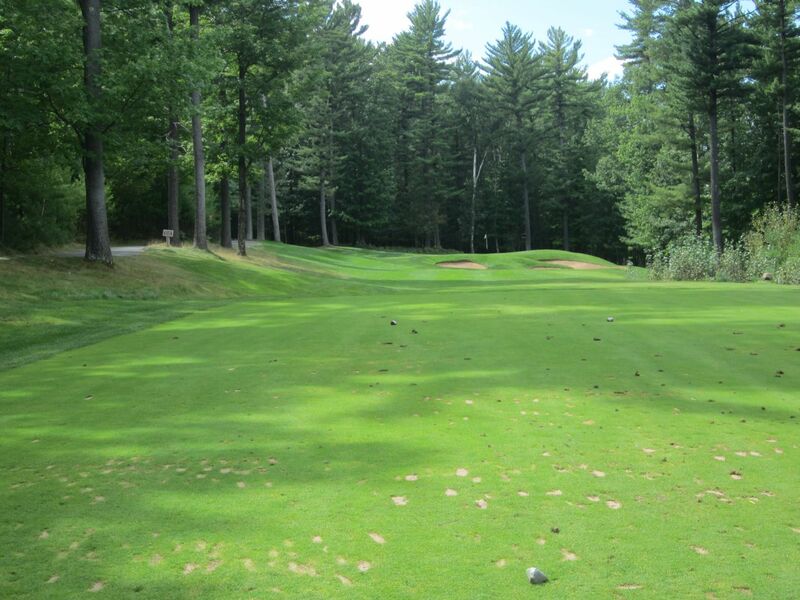 At 202 yards from the granite tees, the third is much less intimidating after getting to the green area and seeing the twenty or thirty yards of fairway that leads to the green area. Don’t be afraid to use it. The tee shot on sixteen is primarily blind, and must be played left of the rock wall that builds up the right side of the fairway. The elevated green requires an extra club to hit, and runs long from front to back. The back side of the green falls off quickly, though, to a very deep sand trap and woods beyond. 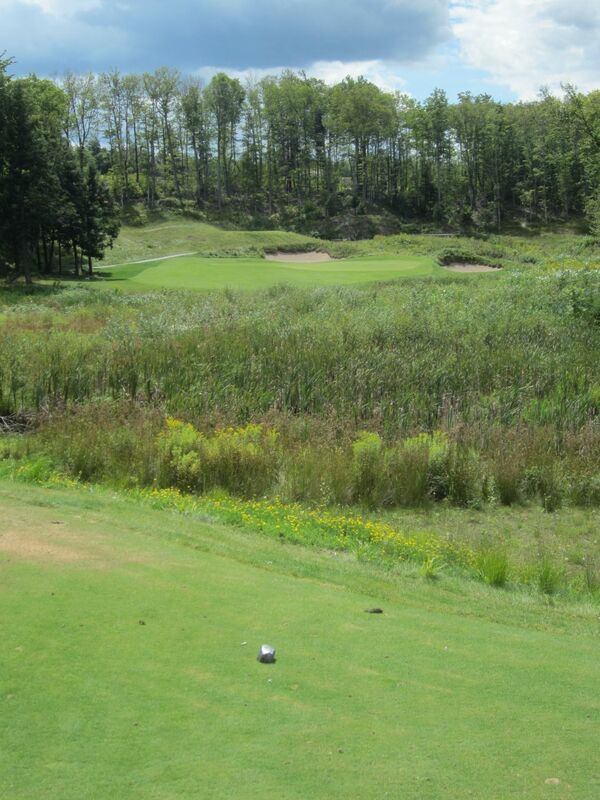 Seventeen looks to be the simplest hole on the course at Greywalls. A short par three of just 137 yards from the granite tees, a lofted iron or wedge can be used, but must be played over the front side sand traps. 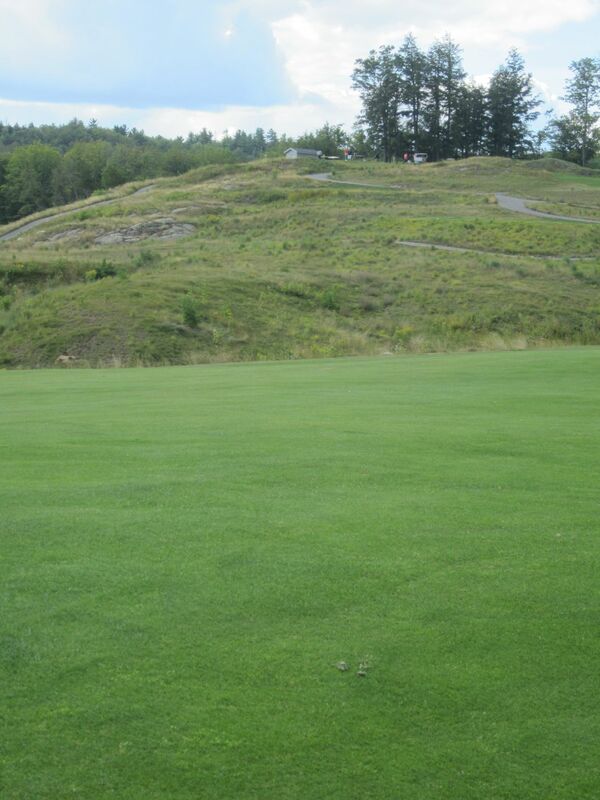 The front-side pin location was just feet from a steep drop-off in the green that led off the back side. Eighteen is a return to the style of golf found on the front nine. With woods on both sides, the fairway drops downhill acutely. Hit a good drive on this par five (533 yards from the granite tees) to leave a second shot in the 250-280 range. From there, it is bombs away. Take the longest club in your bag on the approach, as the fairway and rough area widens to a hundred or more yards with no trouble to be found. Even if the green is reached, though, it runs 35 yards from left to right, and 32 from the front to back. Mitch hit this green in two, only to find a hundred-plus foot putt over a huge midway ridge that took four attempts to get in the hole. As a side note, if you see smoke coming out of the hillside left of this green area, do not approach it. We were concerned by the site, and approached the smoke to make sure nothing was burning – what we found was the entrance of a den about two feet by two feet with smoke or heat of some kind coming out. I have no idea what was in that hole, and I was not about to stick around to find out. In summation, Greywalls is unbelievable. 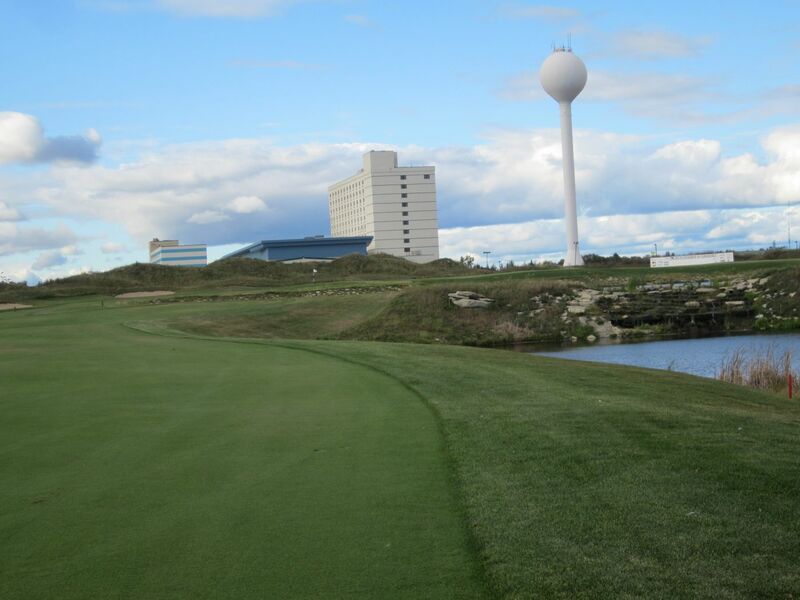 At $130 a round for regular season rates, it is an expensive course but has options that make it more affordable. As I mentioned, everything in the U.P. is inexpensive. 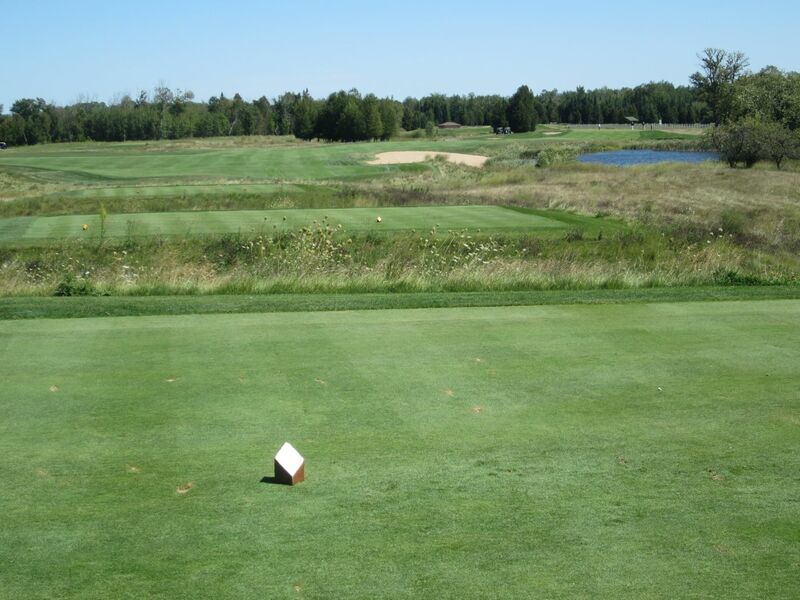 This includes season memberships at Michigan’s number two rated public golf course. U.P. 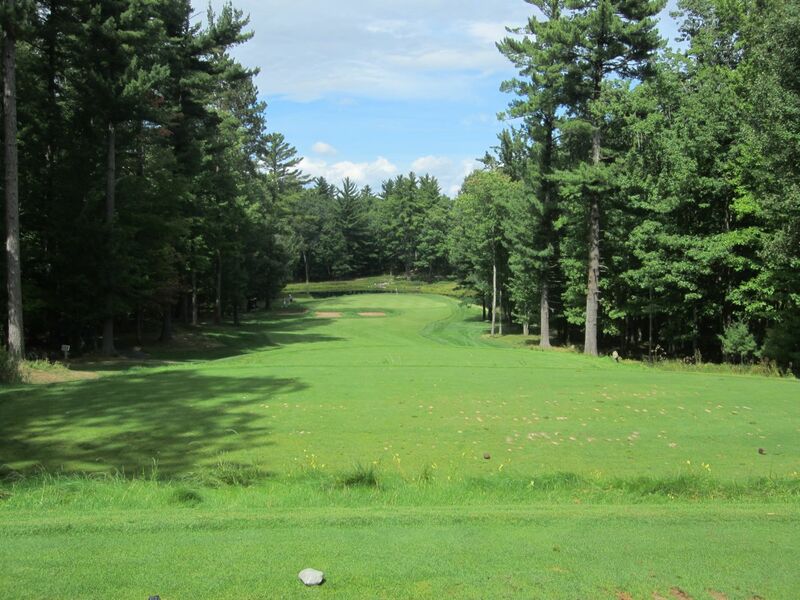 residents can actually purchase unlimited season passes to Greywalls and their Heritage course for just $1,800! It is unbelievable the value that can be found in this fairly remote area. I was pretty intimidated going in to our round at Greywalls. A friend of mine who is a far better golfer than I am told me that he shot a 104 his first time there, and another friend of ours’ (also a better golfer than me) actually shot a 120. Needless to say, I was happy to keep my score under 100. I cannot wait to improve on that next season. 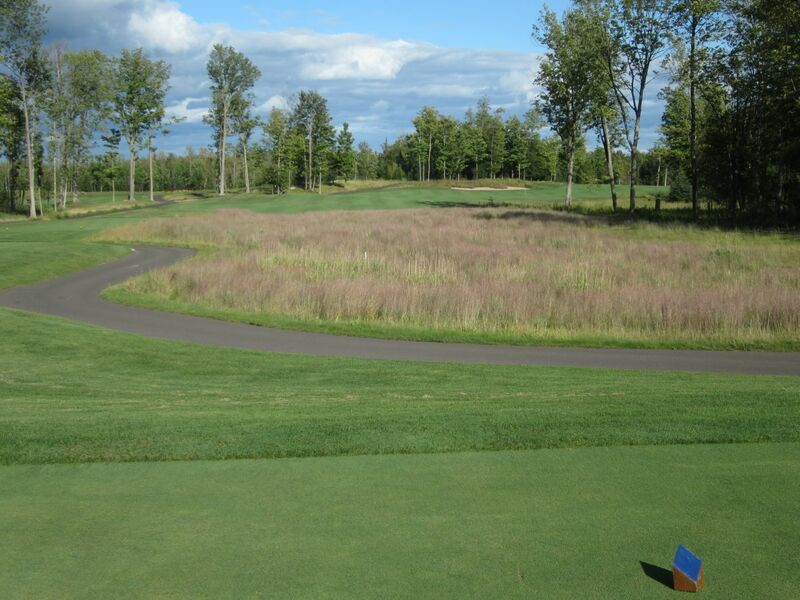 You have probably seen Sweetgrass commercials on tv, and for good reason: A considerable portion of all of these courses’ clientele comes from Wisconsin, including the Milwaukee area. 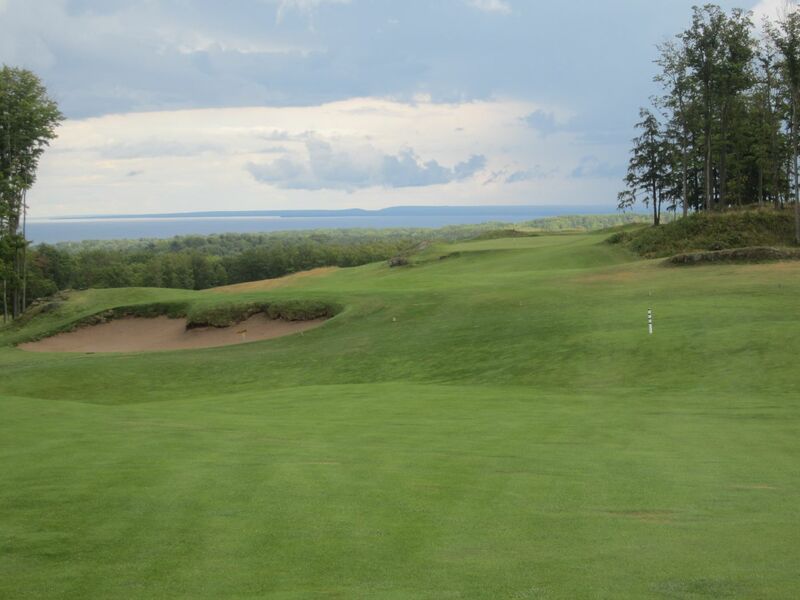 I met with Dave Douglas, the Director of Golf at Sweetgrass, and was impressed with his passion for the course and was excited to check out their track. I was given a 2:15 tee time, and arrived at the practice facility shortly before. 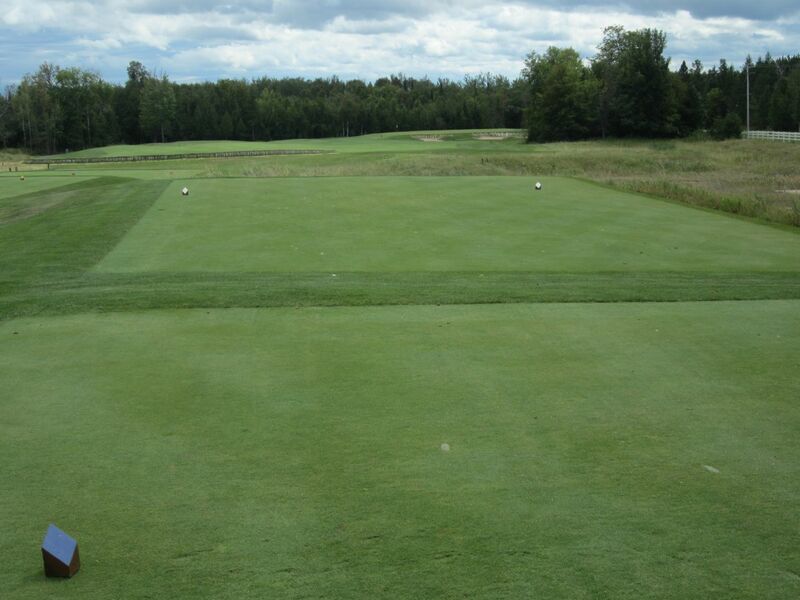 Sweetgrass has a beautiful driving range with six target greens and interconnected fairways. The range was mats only during our trip, but there was a sizable natural grass area that had recently been treated that looked wonderful to hit off of. To the right of the driving range is a chipping area with a large sand trap and three pins. 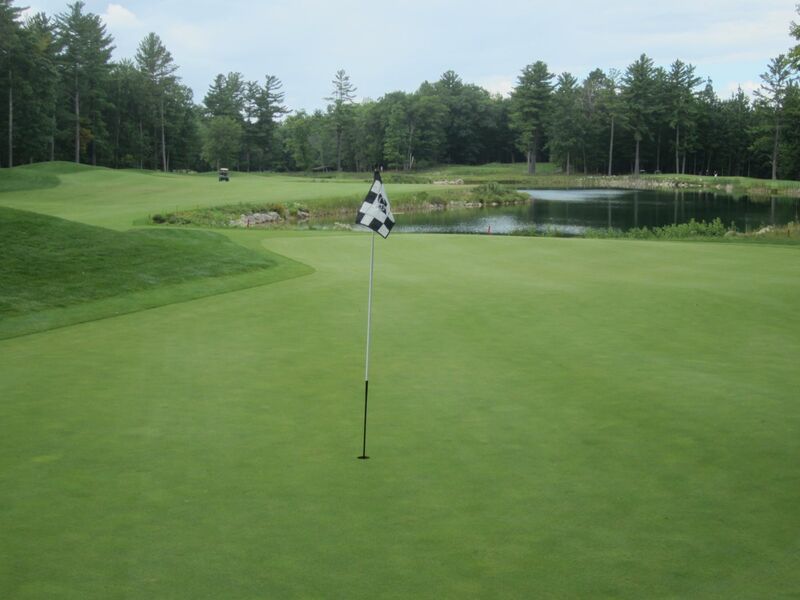 To the left is a good sized putting green that is perfectly true to the course’s putting conditions. On Friday, when the rest of our group arrived, almost everyone commented on the great speed and flawless rolling surfaces. If I had to guess, they roll at a minimum of 10.5, maybe eleven. This was going to be good. I finished up my round preparations and made my way to the tee boxes left of the starter office and snack shop. I put a tee in the ground and heard, “Hey Paul, that’s the tenth tee.” Typical me. I grabbed my tee, shrugged it off like I was just kidding around, and made my way right of the chipping facility to the first hole tee boxes. Making the turn to these tees provides a welcomed site: A short par four with a wide open fairway. The railroad ties fortifying the greenside bunkers look really nice, and remind me a little of the same features found on the Irish at Whistling Straits. Keep your tee shot middle to right on this hole to leave a good approach. With a top-right hole location on Friday, this pin was nearly inaccessible from the right, as everything flows from the top-right down. 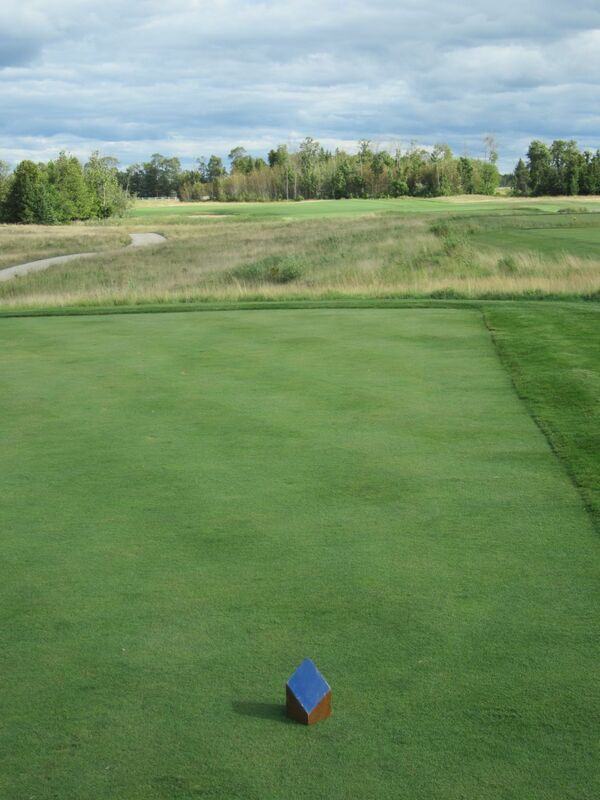 The tee boxes at Sweetgrass are all perfectly squared and level. This is not like teeing up at Dretzka. 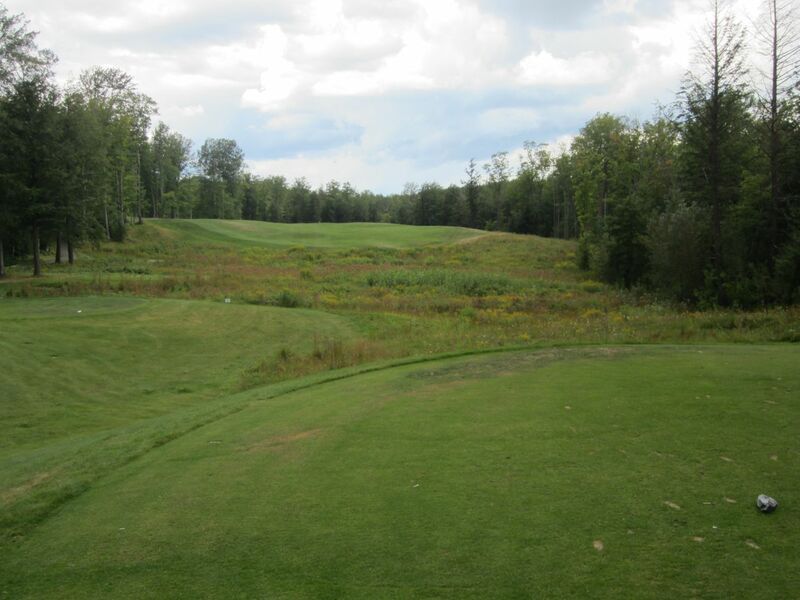 The second hole is a medium-length par four of 372 yards from the blue tees. The trouble is mostly out of reach, so feel free to wail away on your driver. 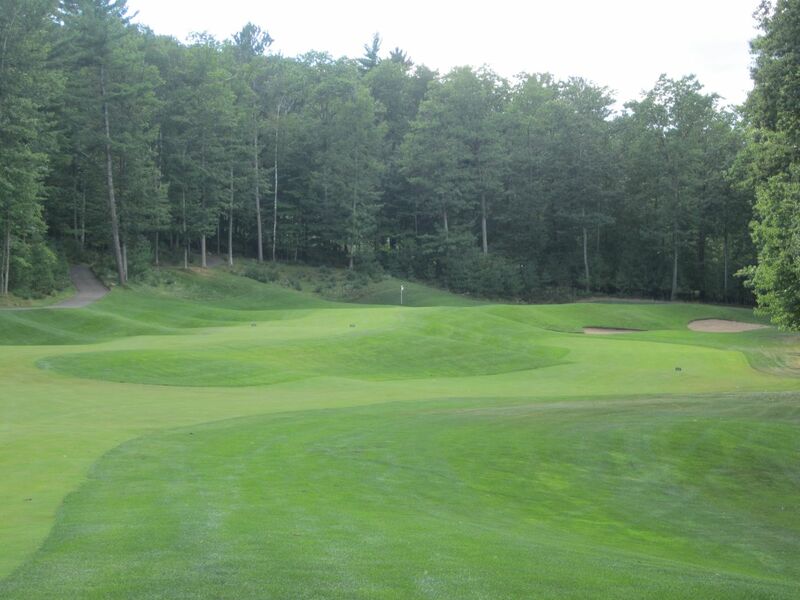 The approach features a kettle on the right side, which leads upwards to a green that is heavily sloped upward from the day’s middle hole location. The third is a very tricky par three. Nicknamed “Wolf,” only a sliver of the green is shown to the tee boxes. A large mound resides on the right side, and hides the rest of this deep putting surface. The green is kidney shaped, and a five foot break separates the front from the back. With a front side pin location, err short, if anything. Four is the first of three 450ish-yard par fours on the course. At 448 yards from the blue tees, the tee shot is almost entirely blind, but a prevailing wind from over the left shoulder will carry a long drive down the right side of the fairway. The approach is long and tricky, as anything left will carom off that side of the green and find a pitch up a 20 foot high hill. Five was one of the most intimidating tee shots on the course for me. 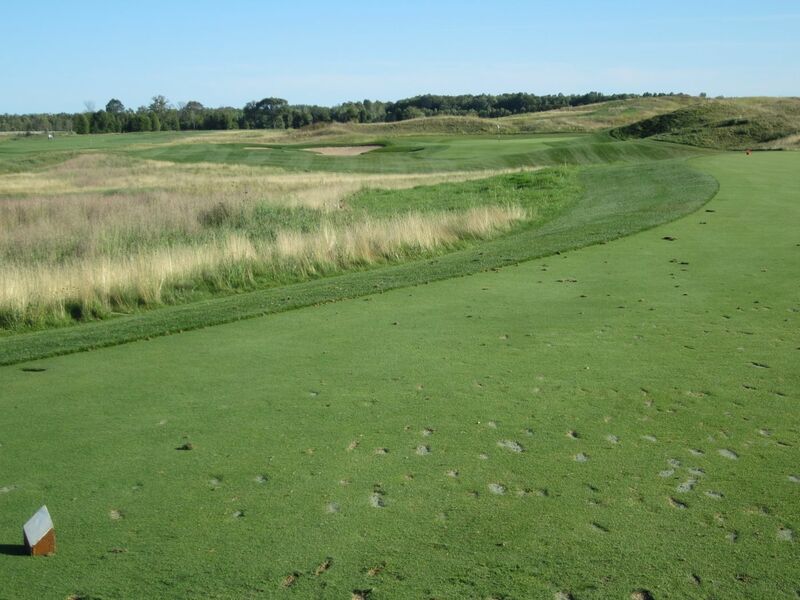 With water on the right side, and sand leading up to it, the left side is populated with heavy fescue and influences a tee shot with less than driver. Hitting short on this hole leaves another long approach to a green that is long and runs downhill from front to back. Six is a whole ‘nother animal. 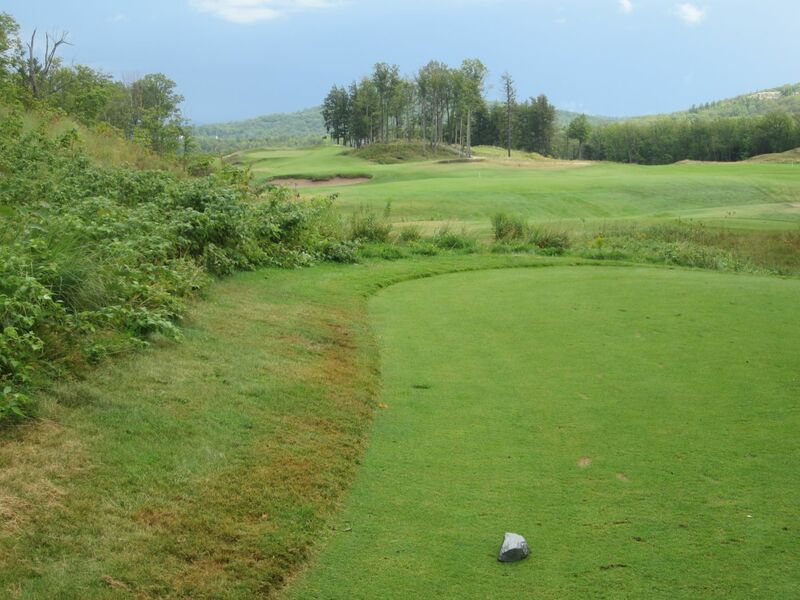 Nicknamed the “Sacred White Deer,” this hole played straight into the wind on both days. 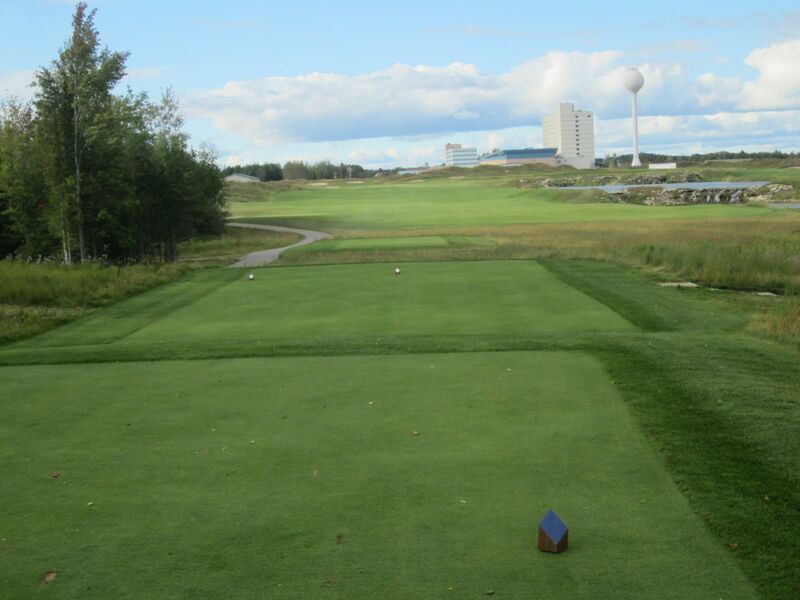 At 599 yards from the blue tees, this is a long way to hit three straight shots! During my first round, I passed the only group I saw on this hole, and rushed myself straight in to a lost ball. 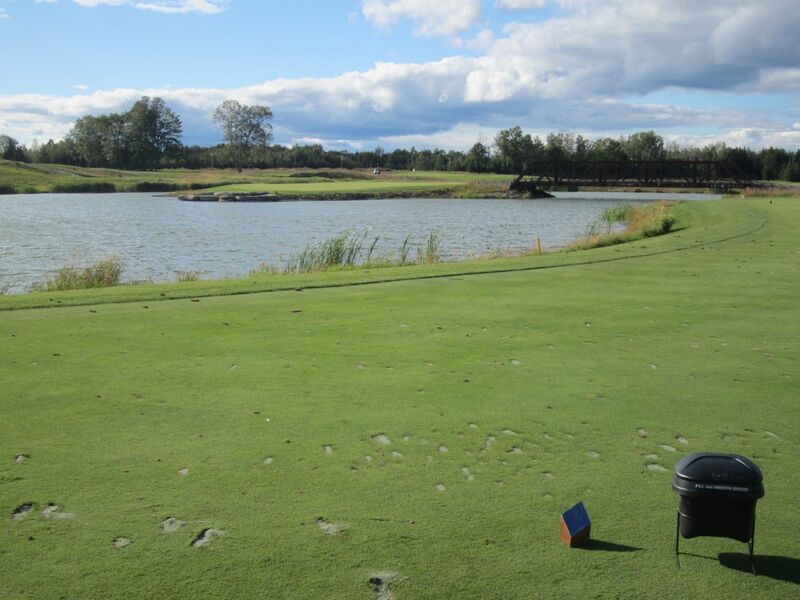 My second time around, I put a drive in to the fescue on the right side of the water, then put a good swing on a three-hybrid and then a low trap-drawn six-iron to eight feet from the pin. I would miss this putt, but it was easily my best par of the weekend. The seventh is a brutally difficult par three! 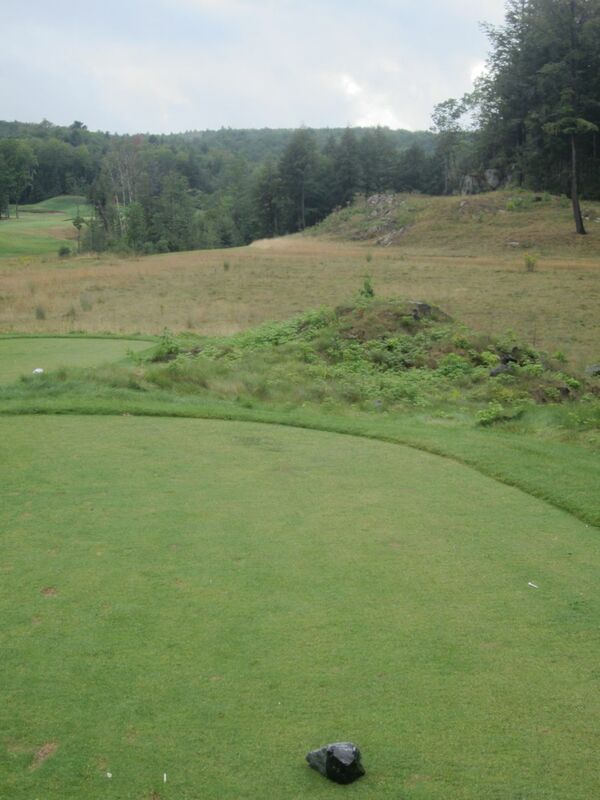 At 206 yards from the blue tees, it played directly in to a strong head wind and considerably uphill. With a back-left pin location, this made for a 234-yard tee shot – simple enough. The eighth has a long sand hazard running along the left side, and water left of that. The right side is heavily covered with fescue, but is safer than the alternative. A strong left-to-right wind brought all of my drives that direction, and I bogeyed all three times (Friday, Saturday and another nine-hole re-play). The green is risen above a deep sand trap on the front-right, again beautifully fortified by white railroad ties. The ninth and eighteenth holes remind me of several other area golf courses: The National at Fox Hills, and Shepherd’s Crook, in Illinois. 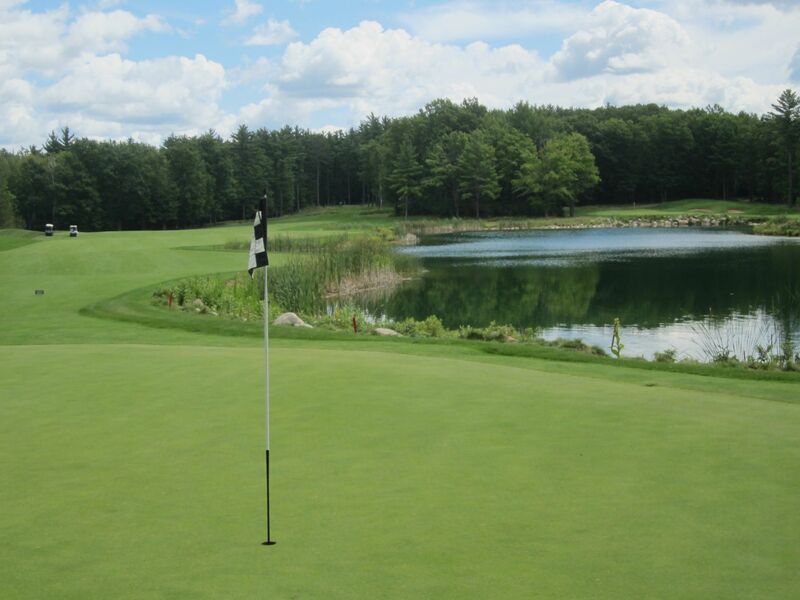 Each of these holes share a common water hazard, which separates the two layouts, and feature a shared green that must be hit on the fly in order to hold. 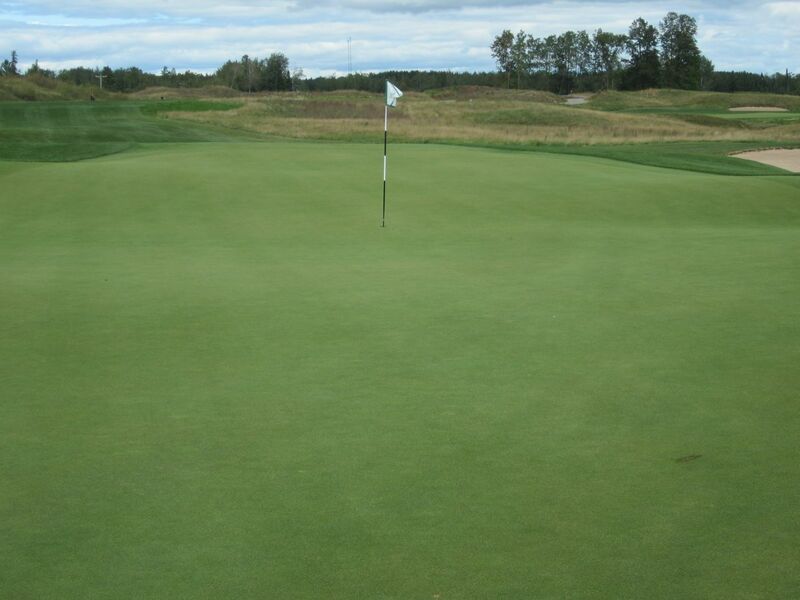 The putting surface is slightly slanted from bottom to top, which helps hold approach shots on the green. I was happy to have played this hole on Friday, as the key to it was revealed to me quickly: Stay right. The second shot can be probably 75 yards right of the interior pond, and will actually leave an approach shot that will not have to carry the water. The back nine begins with another great driving hole. With mounding on both sides, it’s bombs away on the tenth. 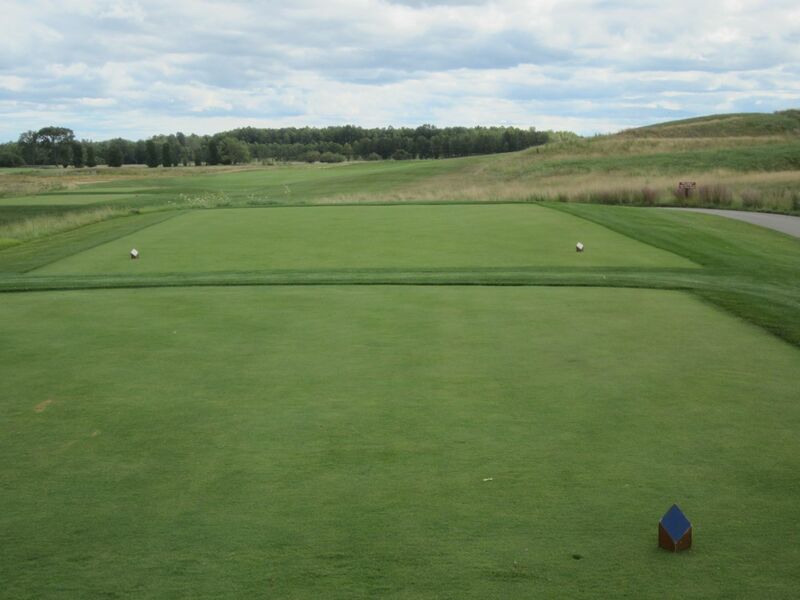 Eleven is a mid-length par five that measures 528 yards from the blue tees. With a wandering fairway bunker that cuts in to the middle of the driving area, the hole runs slightly left and uphill. Stay away from the left side, and hit long on the second shot toward the trees that border the right side of the fairway to keep safe and leave a short approach. Twelve is one of the most visually beautiful, and intimidating par threes I have seen this year. 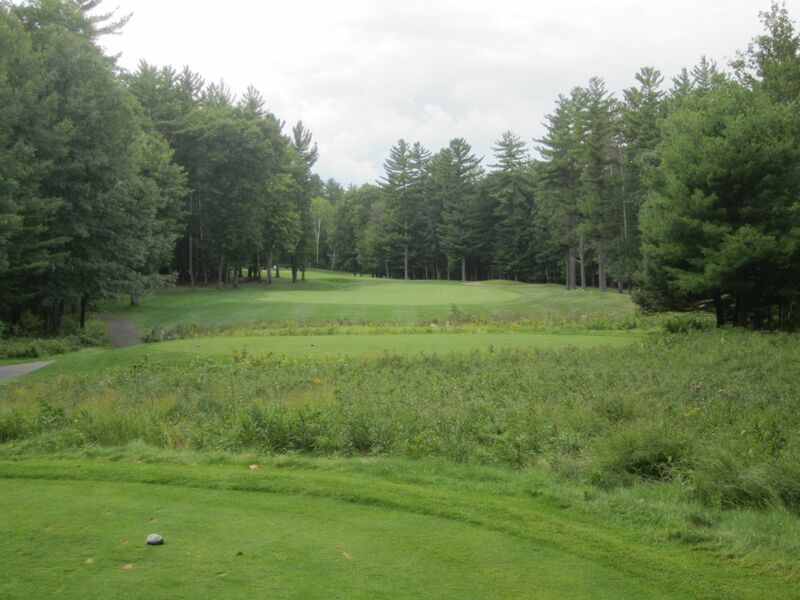 With highly elevated tees, the front side of the green looks almost like an extension of the fairway, but runs slightly left and severely downhill to a middle hole location that is about ten feet below both the front and back green surfaces. A back pin location is considerably tougher, as the entire 200-plus yards must be carried and held for a legitimate chance at birdie. 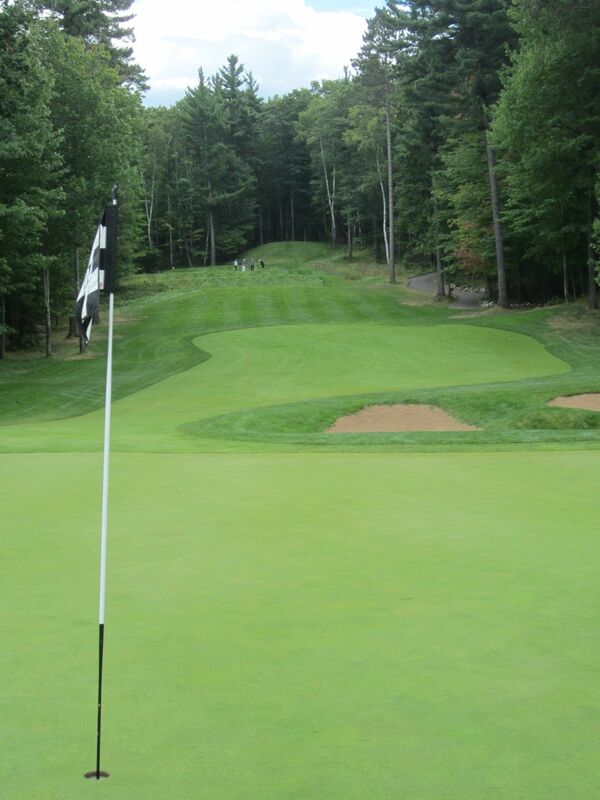 A long par four, the thirteenth is nicknamed “Eagle” after the two bald eagles that defend the back side of the green. 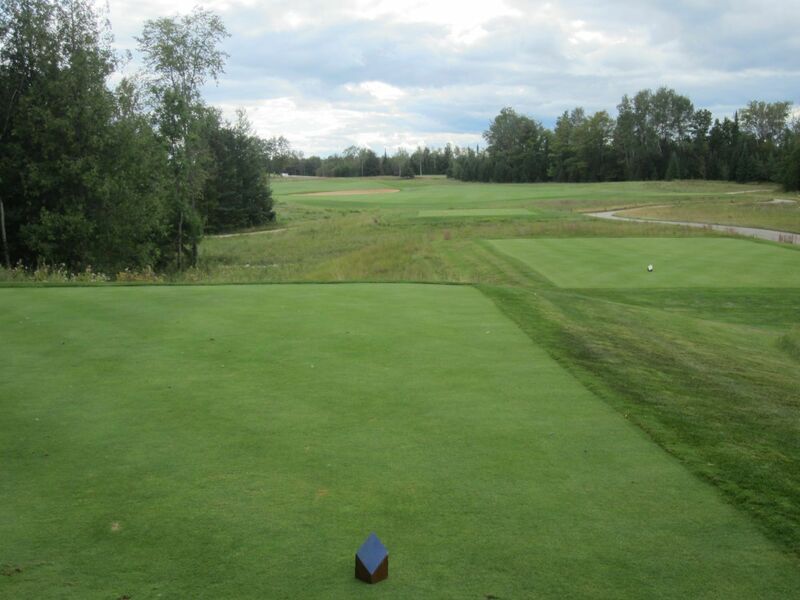 At 456 yards (blue tees), the drive has got to be long and in the fairway. 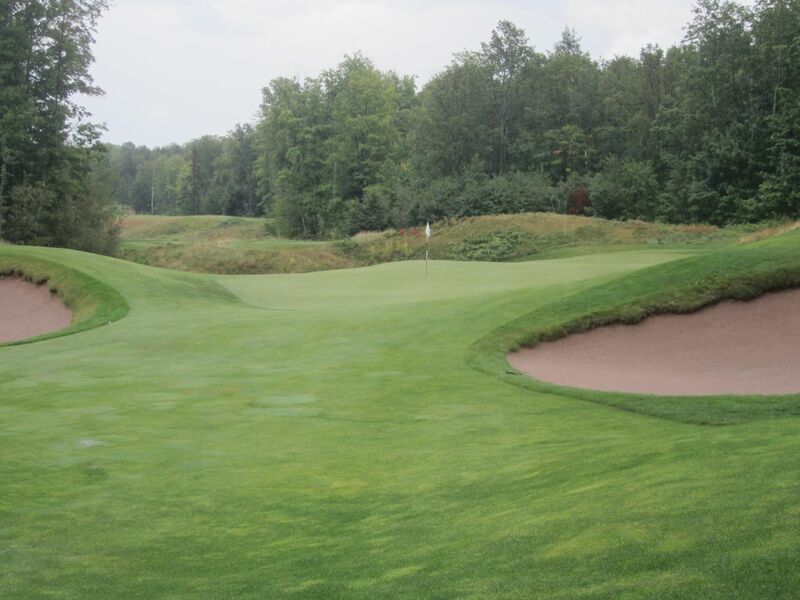 The approach will be equally as long, and must carry or go left of the two greenside bunkers that reside on the right side of the approach area. Making the turn to the par four fourteenth hole is refreshing: “Alright, a short par four – this should be scorable.” The fairway runs laterally from left to right, and will require about 200 yards to carry the wasteland and sand trap that fronts it all. The most challenging aspect of this hole is the green area. The course started shaving the “rough” around the green to a height barely longer than the green surface. Anything hit on the right side of the green is likely to run off, and down the hill. On my first time playing this hole, my second shot hit within feet of the pin (in the middle of the green), only to spin right and down the hill. I then played a 56-degree wedge out of the sand to the top of the hill, which subsequently rolled back to where it started. I tried again with the same result, then was equally disappointed in the result of a running nine-iron. From birdie putt to quadruple bogey – I learned my lesson quickly and instead chipped in during my second round (it was very lucky). 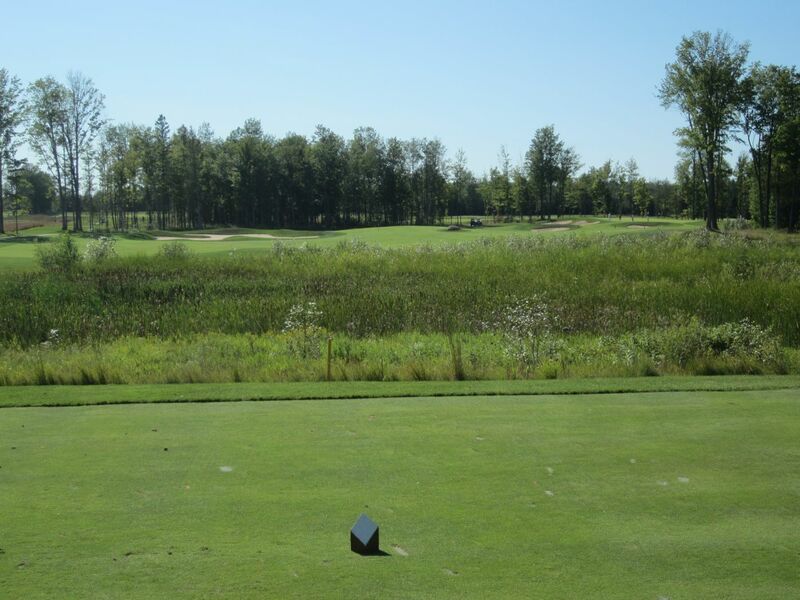 Fifteen is one of the signature holes at Sweetgrass. 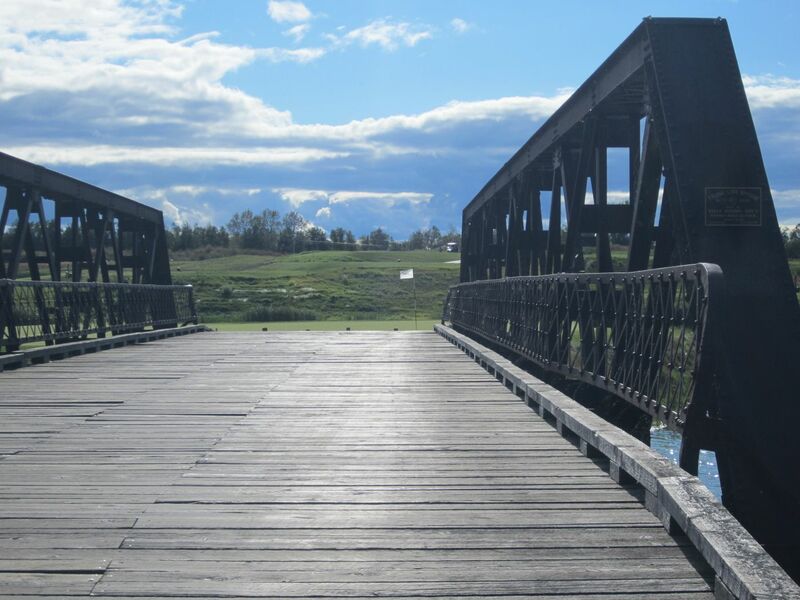 With a true island green, a picturesque steel and wooden bridge leads the way across the pond to a large green that should not be as difficult to hit as it is. At 152 yards from the blue tees, this is not a long shot, but did play in to the wind for both of my rounds. I hit a hard, drawn seven-iron my first time around, and found myself with a forty foot putt uphill that would take me three attempts to finally hole out. For our Friday round, the wind was even stronger and the green was hit by only one player in our group from the white tees… With a three-wood. My six-iron didn’t get close, and neither did anyone else’s. Fortunately, the drop zone is on the front of the island. Sixteen is a knee-knocker of a par four. Through woods, the driving area looks miniscule but is actually quite wide. The approach, though, is bound to be very long to an elevated green 456 yards from the tees. Finish up on sixteen and make your way through the woods to seventeen. The sign advises that the white, blue and black tees are across the bridge. Cross this long bridge and find elevated tee boxes looking out over a vast wasteland and a fairway that runs from left to right with an overabundance of hazards: Six huge sand traps, woods on both sides, a huge pond and wasteland, and a grand boulder that symbolizes a turtle to this hole nicknamed “Wisdom.” The biggest wow-factor of the course is beheld on the seventeenth at Sweetgrass. This is a beautiful golf hole, and if the drive is not challenging enough, the green area is. Highly elevated, two deep sand traps front the left side of the green complex. 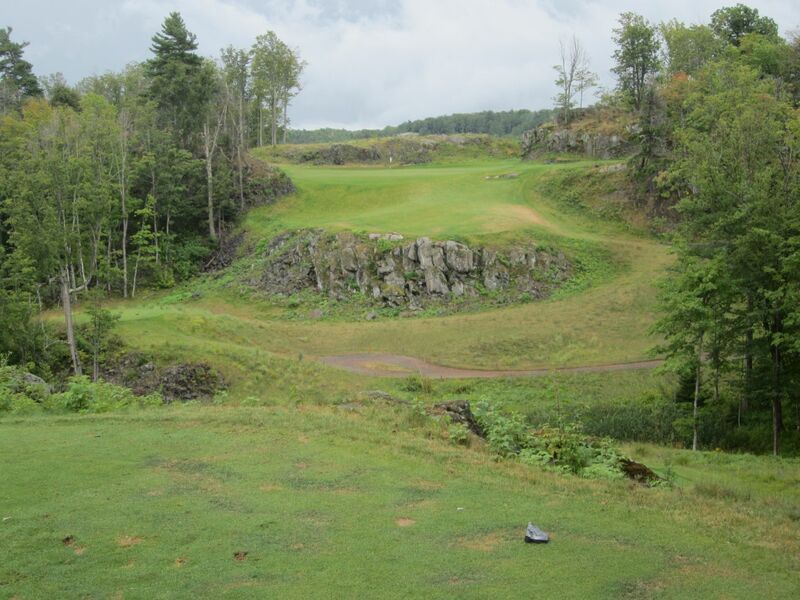 This was one of my favorite holes of our entire U.P. trip. Eighteen plays almost exactly opposite of the ninth, and runs parallel to its counterpart. 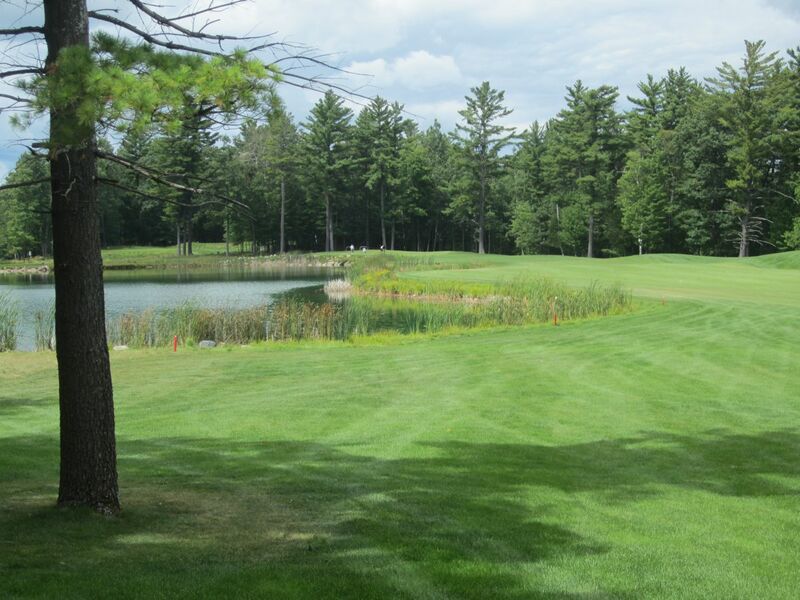 A huge pond and picturesque waterfalls border the right side of the fairway, and must be avoided. The second shot can be played well left of the pond, and will leave an approach that takes most of the water out of the picture. Take a moment to snap a picture from the opposite side of this pin, as the look back is quite beautiful. One of the wonderful things about the U.P. 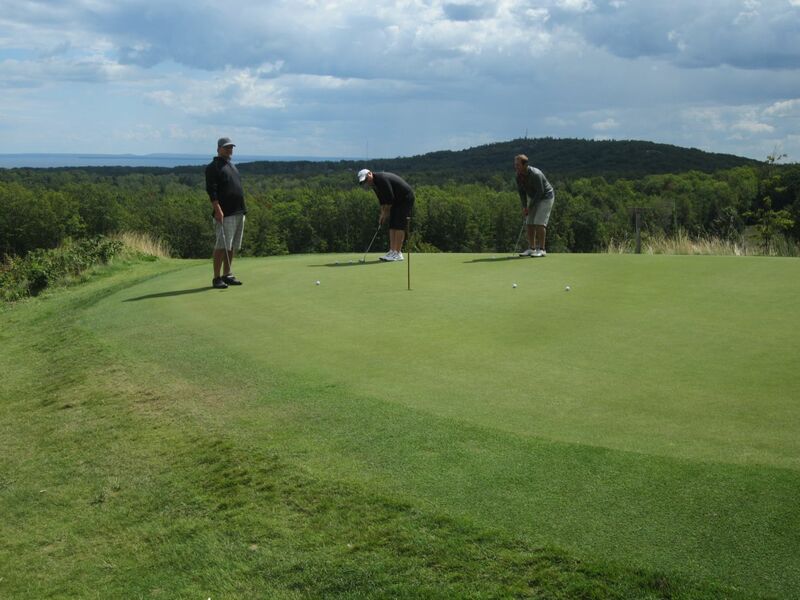 golf trio package is the variety of outstanding golf that will be found. I have talked to a number of people who have made this trip who like Sweetgrass the best of the three: It is playable, and not at all gimmicky. The conditions are outstanding: The tee boxes, greens and fairways are all impeccably maintained, and the course is fair, beautiful and provides countless opportunities for shot-making.